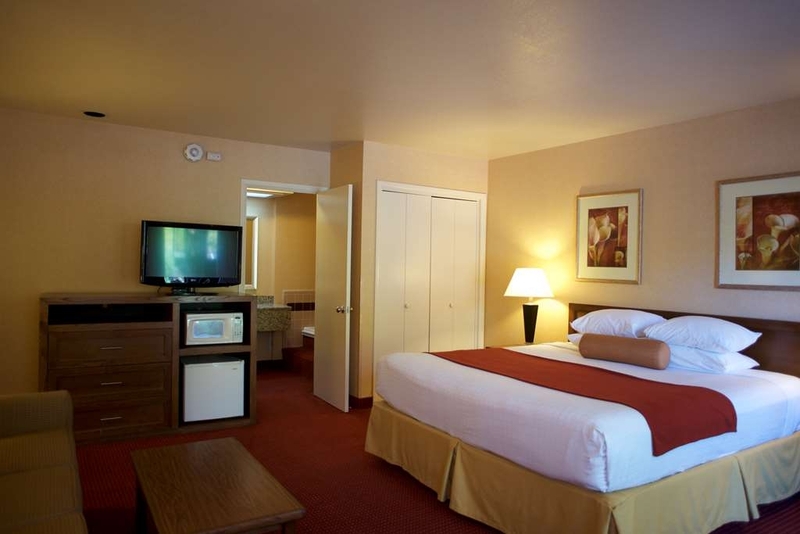 The Best Western Grants Pass Inn is ideally located in the center of Grants Pass. Come and experience our hotel near the major tourist attractions. Best price guaranteed and exclusive deals. Southern Oregon is known for some of the best rafting, kayaking, hiking and outdoor adventure in the northwest, which is why our Grants Pass hotel caters to families and adventure seekers. Maybe you're in town for a Hellgate River Tours trip, or maybe you want to see what you can discover at the Oregon Caves. Of course, a day trip to Crater Lake is a must when you're in this region. 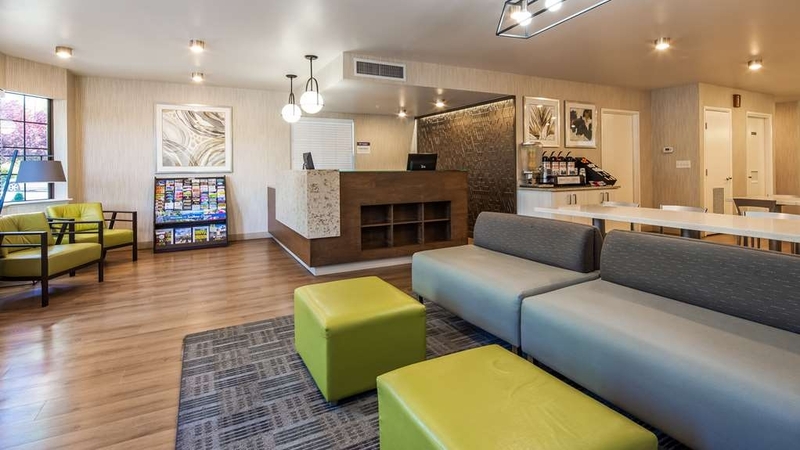 No matter what your vacation has on the agenda, our Grants Pass hotel puts you in the perfect place to explore the area. Our location is right off of I-5, so it's easy to explore or take a quick trip to historic Jacksonville or Ashland. Exterior entrances make it easy to get to your room, or perhaps unload your truck or RV full of camping or rafting equipment. No matter what your day holds, our seasonal outdoor pool and year-round hot tub are the ultimate treats to help you relax. Boat races are a popular attraction, and the biking and fishing in the region are ideal. To get your exciting day started on the right track, leave breakfast to us. 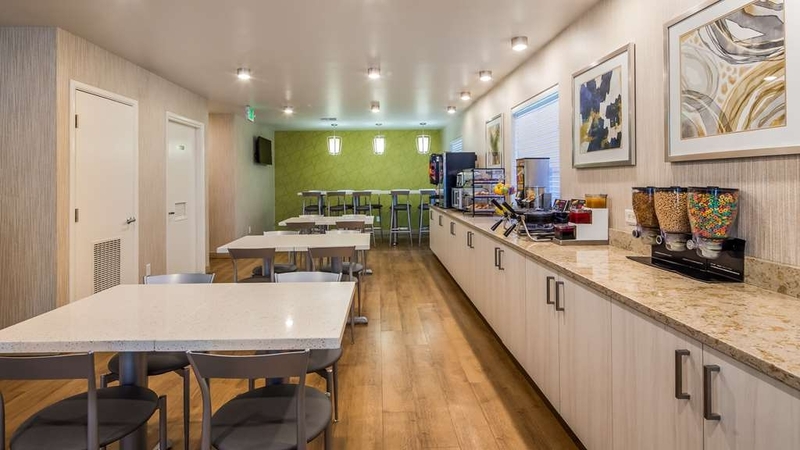 Our Grants Pass hotel offers a free, generous breakfast spread every morning with hot eggs, sweet pastries and fruits, yogurt, cereal, and endless 100% Arabica coffee and chilled juices. Some lucky guests are traveling on business, and get the chance to take advantage of our quaint, small-town charm that's surrounded by the great outdoors. 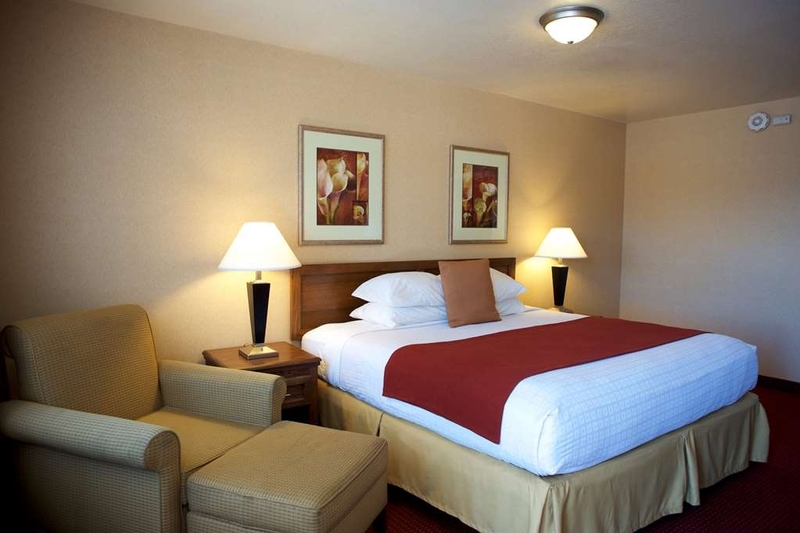 Our Grants Pass hotel is close to medical offices and just 28 miles from the Medford Airport. Location is everything, whether you're gearing up for a serious river trip or need to take care of local business. 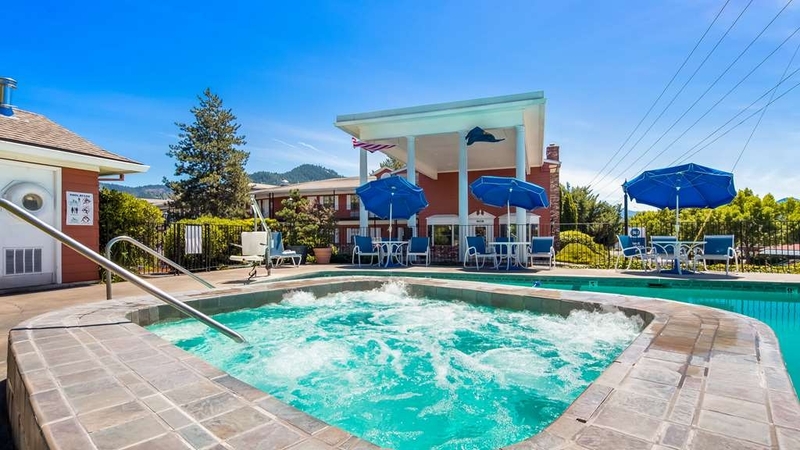 Book a relaxing stay at Best Western Grants Pass Inn, where exploration is right outside! "Good value, good staff, good breakfast..."
Clean and quiet, but could use renovation (lamp shade dying, chair upholstery could use a shampoo)..The location is convenient (near freeway exit). I'd like to see grab bars in the bathroom/tub. The Elmer's restaurant nearby is great to get you when you are too tired to drive. They make an effort to be better at breakfast than some (breakfast burrito, for example). The hotel is very much in need of a remodel. The room itself seems clean enough, but with really old flooring, tub, beds, carpet, I couldn't tell for sure. The room was pretty small for a family of two adults and two kids under the age of twelve. We only stayed one night so it was safisfactory. Nothing really stood out as extremely bad aside from being really old. 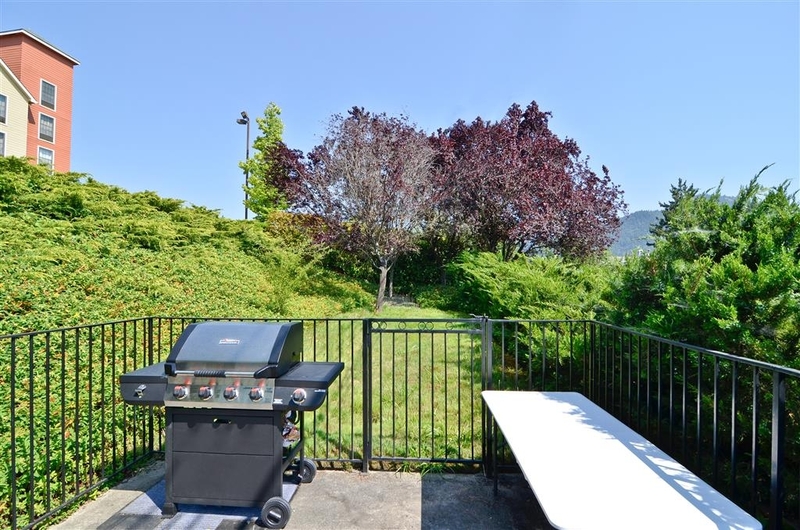 This is truly an easy on off the freeway location and the parking is adequate. Staff very friendly and helpful about local spots we needed to go to. Grants Pass is also a lovely little city. our room and bed was very comfortable. "Only choice in the area...."
This is more like a motel. The place is in desperate need of renovation. It's kept clean and livable but a bit pricier than other places we stayed during this trip that are much newer and nicer. Because of its location there's not very many choices available around the area. Exceptionally friendly staff. Rooms furnished with convenient amenities i.e. coffee maker, hair dryer, iron+board. Crisp and clean linens/rooms, well kept grounds. Conveniently located access from/to I-5; with a restaurant next door. Right next to the freeway. Easy access off and on. Yet no noise! Great breakfast, good rooms. Expected frig and micro but were not in our room. Great suggestions for dinner. Locals really know their food. "Nice reasonable place to stay." This is a very nice Best Western with a delicious breakfast. Be aware there was no fridge or microwave in the room - otherwise the room was clean and comfortable. There were all kinds of great things at breakfast - cheese and salsa for your eggs, bacon and sausage, and toppings for your waffle. Stayed the night as we transited south to Palm Springs. The room was clean, very functional, servce was excellent and the hot breakfast helped to start us our way the next day. Might want to visit in the summer when the snow and cold are gone! Very convenient I 5 location. Very good value for the money. We would make this a stopover place n the future. Just the right distance from the Vancouver, BC area. 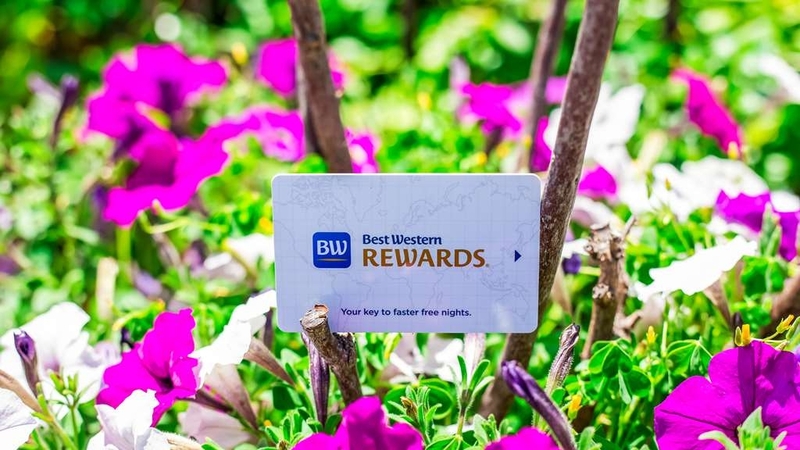 Always nice to get the Best Western Rewards for your stay. This hotel is a bit down in the heal. The lobby is part of the breakfast room and doesn't inspire joy. The rooms as well are dated and have seen some hard use. The bathroom areas have been updated but the rest is just OK. Breakfast was sparse by the time I got there. The scrambled eggs were hard and turning color and there was almost no bacon. The attendant was out smoking and didn't realize anything was wrong for a good while. I stay here often. It is passable but nothing to write home about. Best Western as a franchise has come along way. Super affordable, very nice staff, and the accommodations were above my expectations. On par with much more expensive hotels and they had local art throughout the hotel which I felt was a great added touch. "Perfect 1/2 Way Overnight Stop"
I travel frequently from WA to CA and back by car (don't ask), and I love unwinding at this half way stop in the outdoor Jacuzzi when the air is freezing. In the morning, manager Jamie, and Stacey, and Kendra made sure breakfast was just right, and it always is! Thanks to Ken and a special shout out to maintenance hero Thomas who went above and beyond the call of duty. Pretty good new taqueria across the boulevard is a good addition to this freeway convenient (don't really hear it yhoughsome rooms get local traffic noise) neighborhood. In summer, I then take HWY 299 (a beautiful drive) then 101 (also!). "Quick Overnight Stay For Friends!!" Very clean rooms, great breakfast, with lots of variety and very friendly staff! Will recommend to our family when they come to visit!! The fireplace and lounge area in lobby was very nice and cozy, and dining area was very roomy!! "Favorite motel of the trip"
Stayed at 4 different Best Westerns during this road trip and this one was my favorite. Check in was fast and easy, staff very friendly. Was able to drive right up to our door and unpacking was easy, just what we needed at the end of a long drive! Room was clean and comfy, large sink area, fast wifi. No fridge, microwave, and the coffee maker was hard to turn on, but during this stay we didn't really have need for any of those. Loved the shampoo/conditioner/lotion scent and even tried to later find it to purchase online, but they appear to be a BW exclusive. LOTS of restaurants within walkable distance and they even told us that if we show our key at Elmer's there would be a discount. Breakfast room the next morning was definitely one of the better ones I've seen. LOTS of selection, lots of room, very helpful staff, and a cozy fire in the fireplace. Will have to remember this one for a return stay. Rooms/lobby and grounds were clean, although bath/toilet area small. Pillows could be more comfortable. Breakfast was fine, I'd rate average. Staff very nice and helpful. Check in/out easy and quick. For the price I would come back. Motel has been renovated. Beds and bedding very nice. Room was clean and had everything we needed. Staff were very friendly and efficient...check in and out was a breeze. Breakfast room was very clean and probably one of the best breakfasts we had during our travels. 2 staff members were in the breakfast room and made sure everyone were well taken care of. 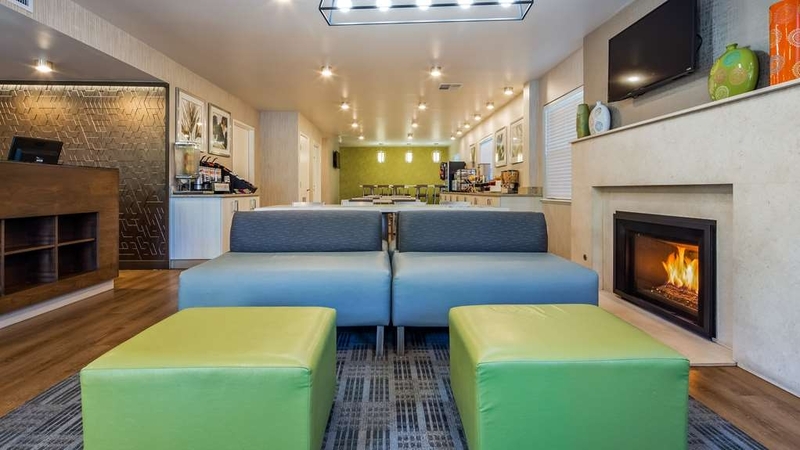 "Great place to stay while in Grants Pass, OR." Always love staying at this hotel while in Grants Pass Oregon. Nice setting with Elmer's restaurant next to property, Applebee's restaurant across the street - and major shopping stores and conveniences nearby. Close to I-5 Freeway and Rogue River. Very friendly and professional staff. Though the lobby of hotel is nicely decorated the rooms are tired. We had an upstairs room. The doors are external only so there was some noise and light showing under the door. There was a smell in the room which was a mix of clean smell and rich history of others. Our room was small but affordable. The walls were a little on the thin side and I could hear the neighbors TV. The bathroom was really tiny. The caulk around the tub was sloppy but clean. The coffee from lobby was good. Breakfast was so so (fake eggs). Bed was comfortable as were pillows We decided next time to upgrade and pay another few dollars and try another hotel for the extra level of comfort and newness. Travelling with a dog, choices can be limiting. But Best Western pet price works for us, The cost, service and room were all very good, but if you reserve there ask for a room away from the road, very noisy. The office staff where very abliging, and helping. If you make a reservation ask before hand for a frig and/or microwave. They seemed a little shocked that we would want a microwave. Breakfast was good but they did not top some of the food and seemed a little put out when asked if there was any more bacon. This hotel was very cute and clean with the brick work and white shutters surrounding each room window. The bed was very comfortable. The room was very noisy as we were in the back corner close to the off ramp. We could hear the big rigs all night long using their jake brakes. But, overall, we had a very nice stay. The staff were all friendly and helpful. The service and staff are excellent, the rooms are clean, and the breakfast is OK, but this is a bare-bones motel masquerading as something more upscale. No fridge in the room, much less a safe. Bedding skimpy and lumpy. Flimsiest coffee-maker I've ever seen and no handy outlet to plug it in. South-facing rooms, and that's half the motel, face Rte 199 and are noisy. 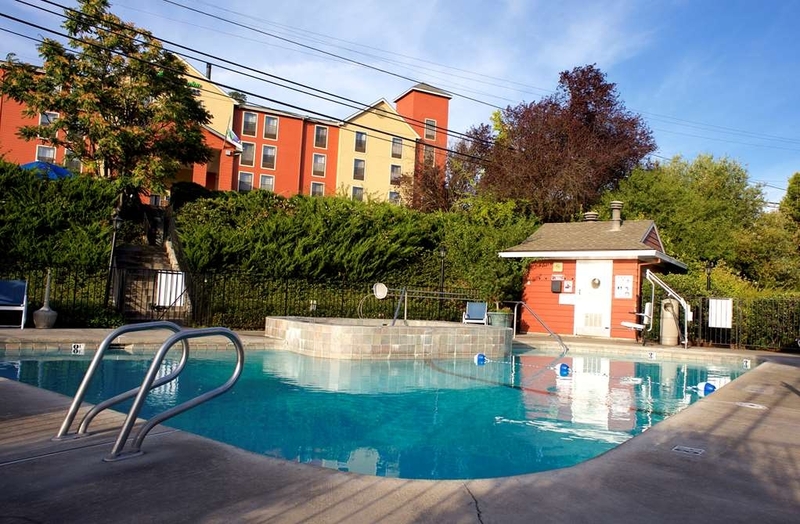 You can get better amenities in Grants Pass (and a lot of other places) for 3/4 the price. Driving back from Seattle, I made it as far as Grants Pass. I could have gone farther but closer to Ashland, prices go up, and the Sacramento Valley was experiencing a scorcher. With nearby eateries, and right off i5 it was a good decision. The room was clean, the bed comfortable (even the pillows) and the a.c. worked well. Well rested and fed, I headed on home. I will keep to this plan on future trips. Thank you so much for your kind words. I will share your review with the staff. Please, come see again. "Average place nothing to write home about"
The rooms were okay, they were clean, the toilet did not work properly. Bed was average, though you could feel springs coming through, temp control on the room worked well, pillows went flat when you put your head on them the blinds blocked out the lights. Internet worked, seemed okay on the speed. Staff did not seem engaging, did not care when reported that stinging bees were at the pool. Child got stung, when reported, there was no care about the incident. Thank you for taking the time to let us know about your concerns. Per our conversation on the phone i have spoken with the gentleman you are referring to and offered additional training in how to handle these kinds of situations. I have also shared your other concerns with the staff so we can fix these issues. Thank you again and I am so sorry you had this experience. "My room requires a bulldozer"
Thank you so much for taking the time to leave us a review. I have informed the staff of these issues so we can get them taken care of right away. I am so sorry you had an unpleasant stay. We rented three rooms for our family. We had booked ahead and were able to save quite a bit of money rather than checking in at the last minute. The facility was very clean, the one washing machine and dryer were in working order and the breakfast was typical for hotel food. Only issue was my king size bed only had two pillows. I would definitely recommend this business and would stay again. Thank you so much for your review. I am so glad you and your family enjoyed your stay. I will check into the pillow situation. We normally always put 4 pillows on each bed. Thank you for bringing this to my attention. We hope to see you again sometime. "Decent hotel with one major flaw..."
We got to the Best Western Inn in Grants Pass with high hopes based on the reviews. Indeed, the staff were nice, the room was clean and the breakfast was pretty good. For me though, the main thing I want in a hotel is a comfortable bed and a good nights sleep. Not the case at the Best Western. I have been very pleased with our hotel choices while on our 16 day road trip through Oregon and Washington. The beds have been very comfortable and we have slept well. I had begun to believe that the old days of the Concrete Beds in less expensive hotels were over. Not so here. The bed was a brick. Neither my wife nor I got a goods night rest on it. I just don't get why certain hotels use these beds. Maybe they last longer or something, I don't know. This is not an issue of soft or firm preference. I have slept on many beds with a variety of firmness and can sleep OK. This bed was awful. No way to sleep on your side without your arm falling asleep. The next night we were at the Oxford Suites in Redding CA for $25 less a night than the Best Western and they had a very comfortable bed. Sorry guys, I don't care about your breakfast as much as a good nights sleep. You get a POOR rating from me. Nothing fancy here, but the room was sparkling clean and the location was excellent for freeway access, shopping for essentials, gas, etc. Good "home base" for our southern Oregon day trips. Really good breakfast and the entire staff was very nice and helpful. Hi Lisa. Thank you so much for taking the time to leave us a review. I am glad you enjoyed your stay and i am hoping to see you again sometime. This is a blue level BW. Very friendly guys at check. Anything you want they will try to provide. My photo shows the room and with just a couple small differences it could have been the room from night before. Clean, comfortable, looks upgraded. Room didn't have the microwave and fridge,but was told if you request it in your reservation they make sure you get them. Offered the Platinum level goody bag or points. The kitchen here is big enough to have the eggs, bacon, biscuits and gravy. Waffles. Raisin toast. Muffins and sweets. Hi Theresa. Thank you so much for your kind words. I am so glad the staff here at the Best Western took good care of you. We hope to see again sometime. "Decent Motel, but no Destination Resort"
This is a clean, adequately maintained, older Best Western just off I-5. The staff is friendly, the rooms are clean, the breakfast is okay. No problems of any sort, but keep your expectations in check! On the plus side, this was my first stay in Grants Pass for more than a fuel stop and the town is kind of a treat. . . . a surprisingly varied restaurant scene and generally a feeling of a well managed smaller town. Hi There! I want to thank you for taking the time to leave us a review. I am so glad you enjoyed not only your stay with us, but our little town of Grants pass as well. We hope to see you again sometime. "Felt like a motel 6"
Door lock was broke toilet wouldn't flush they told us o sorry that is just how that room is. Did let us check out late. Close to freeway which was nice, but a better room higher quality would have made it even better. "Good for an over night stop"
The room was missing a refrigerator and a microwave . . . . however, it was good for a shower and a nights sleep, which is what we needed it for. Good location near freeway and a couple of restaurants. Very good rooms staff was over the top in helping with the check. Nice and quiet area yet right off the freeway. Would stay again. If I have a complaint they could upgrade the beds to give a better night sleep. Everything on the grounds from the pool to the breakfast eating area was in good shape. Looks to be the maintenance staff is on top of keeping this property in great shape. "Want to love it more"
I always stay here. Property is spotless. Staff exceptional. But, the details necessary for a carefree stay are missed. Our rooms were not made up in the midday. Lighting over sink misplaced/dark. Tv's not tuned for proper aspect ratio. I love this hotel/staff, but ALWAYS seem to have small problems. This is a very good place to stop and relax when traveling Interstate 5 through Oregon. Good food next door and lots to see in the area. We got off to a rocky start here, but the terrific staff took care of everything for us. Traveling for business I have stayed at this hotel several times. They have made an effort to get me a room that meets my needs. This last time the air conditioner was not working and they were able to move me to a room with one that worked. I am always pleased with the cleanliness and the front desk staff is good work work with. They were also helpful when I needed to print a document. Breakfast has a lot of variety and offers lots of choices. The breakfast server is a bit over the top in personality and can be annoying if you are still waking up. We had a very nice stay. The beds were great. The rooms were very quiet , even though there were a lot of guests. Easy to get back on the freeway. Very nice breakfast in morning. Staff was effectient and very helpful. 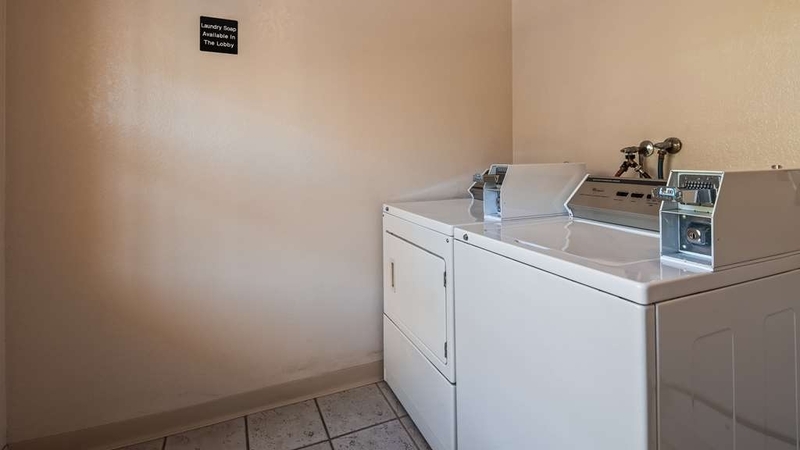 "Great location with surrounding restaurants and easy access to I-5 Freeway"
It was reasonably priced room with 2 queen beds and breakfast included. The room was clean although could use updating for sure. The service at front desk and in the restaurant at breakfast was excellent. 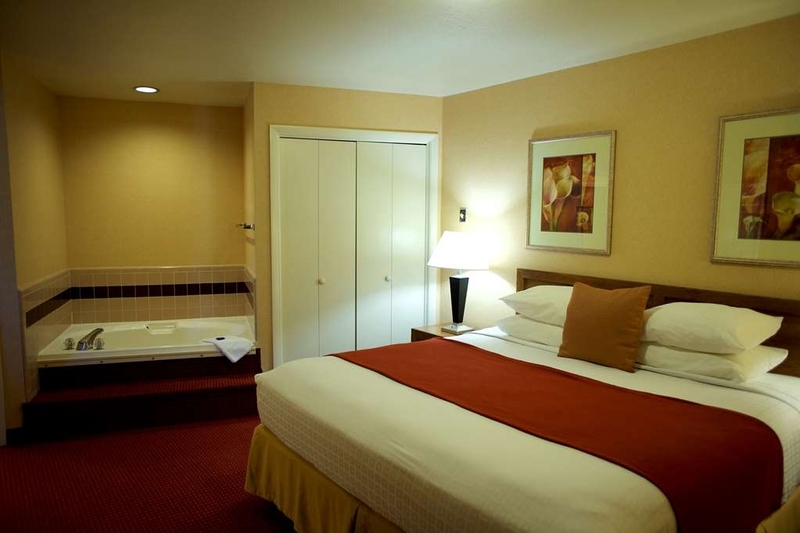 We are big fans of Best Western hotels and have stayed in many in various locations and states. That being said this stay was not a pleasant one. Upon checking in I do have to say that the woman at the desk was very nice, no issues there. The rooms are very close to the highway and you can hear the traffic. It is also on the main drag, again loud. Should have realized it being that all doors are open to the outside. No fridge or microwave in room, couldn't get the heat/air to work and no fan in the very small bathroom creating a sauna along with a loose drain cover in the tub. Loud people outside during the night insured that we couldn't get a night sleep along with slamming doors, hotel and cars alike, loud talking from people outside and first thing in the morning the restaurant next door decided to get new concrete in the parking lot. This is not what I expected for a hotel costing $125.00 per night mid week. It felt more like we were staying at a Motel 6. Never staying here again. A great and comfortable place to stay for travelling through Oregon. The room was clean, pleasantly decorated and comfortable. The bed was comfortable but a little soft. Overall, a very comfortable stay. The staff was friendly and recommended a great place to eat right next door. First - staff was very nice and helpful. Second - old style motel. Had a room near highway and without anything to buffer the noise & it was very loud. Good thing I brought ear plugs. And it seemed to have paper thin walls. Priced for what you get. We were happy to find this motel. 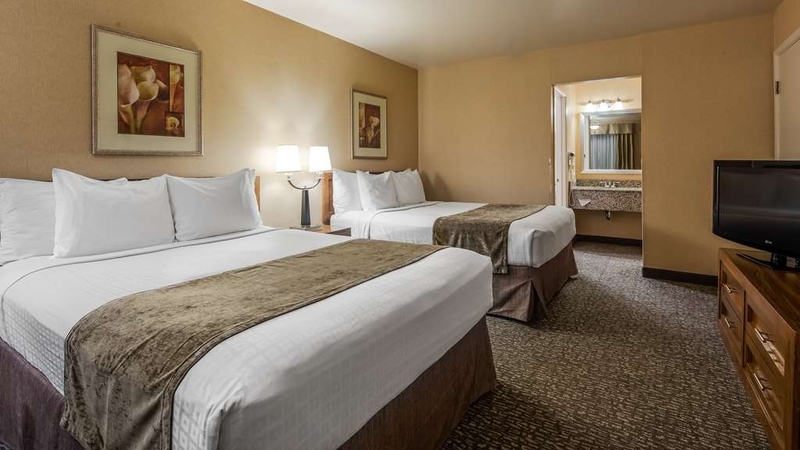 The room was large, very clean, good bed, nice dressing area, 3 sinks, friendly staff, right off the freeway and easy to find, several restaurants near by and a good price. We will be going back soon. It looked nice from the outside. It was very noisy. There were drunks in parking lot. There were lots of dogs barking all night. People were hanging out on the balcony drinking on the 2nd floor. The staff was very nice and looked professional. "Comfort, quiet and great breakfast"
Reasonably priced for everything that was offered. 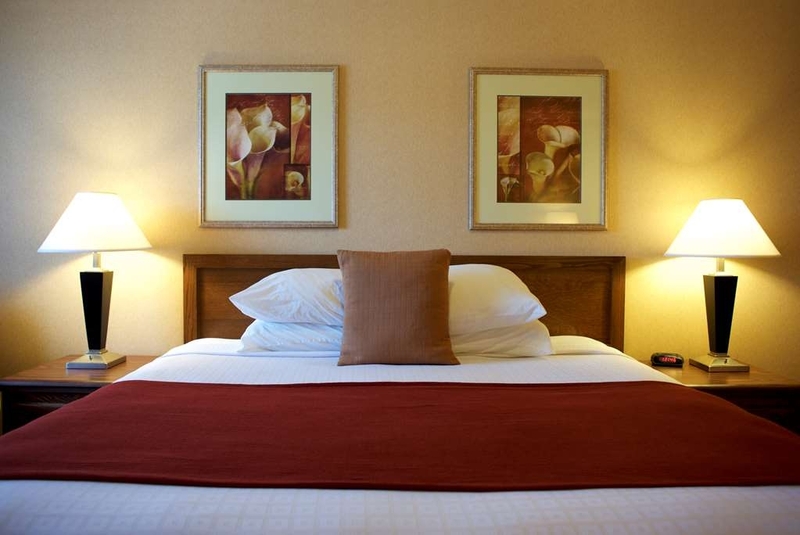 Comfortable beds, quiet rooms, and a large variety of breakfast choices. Very helpful and friendly staff. Would definitely recommend this hotel! Enjoy. I recently stayed here on my way to California. The price and location make this a must stay hotel. It was absolutely fantastic. The rooms were very clean and they had extra towels for me as well. I stayed in and watched premium cable channels. In the morning they had a very nice breakfast area. I give this a 10 out of 10. Good stopping point from Portland on the way to San Francisco. Have stayed here in the past, but this particular time, it seemed to have "slipped a bit", in my opinion. I had a good giggle when I saw they did such a FAB job of redoing the little breakfast bar but sad they didn't put this much attention in to the rooms. I will say the front desk staff was very nice and professionally dressed. Which I frankly appreciate. Back to the restaurant: Hm, lets see, can we say "cocktail tables" without cocktails. It was so awkward to maneuver the buffet bar and there was no way a person with any kind of handicap, let alone a wheelchair could have managed. The food was pretty bad and the hot food was cold and many of the serving trays were empty and this was @ 8:30 AM on a weekday. I couldn't make it work on any level, not even cold cereal, so off to Starbucks I go, I will eat later. I should also stay I don't stay here for the restaurant, but 2 years ago, it was wonderful and got us started heading south, so we didn't have to stop for another meal for hours. My TV also went off cable and it never did come back on. Front desk couldn't help with this issue either. The room was o.k., nothing to write home about, again. Clean, adequate size, bed's o.k., but I can't see staying here past 1 or 2 nights. Not having a frig and a microwave is a down side as well. Honestly, now worth the bargain rate, AAA or not of $125.00 a night, mid week. 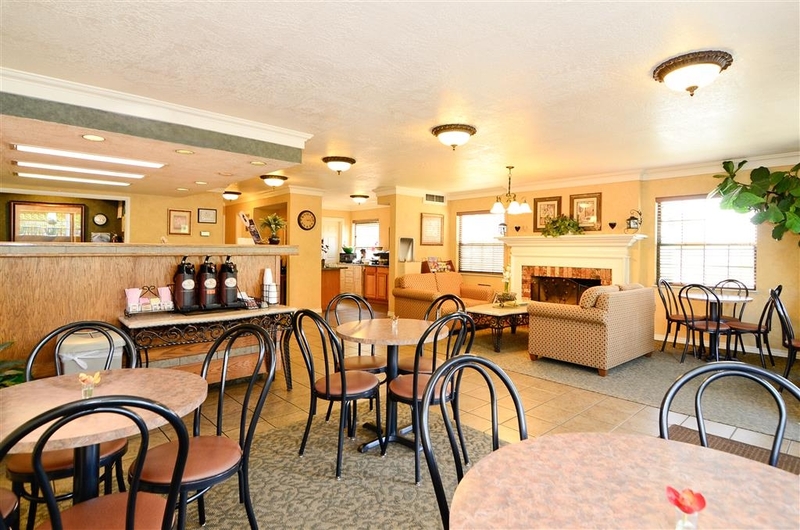 "Cozy Refuge From The Road"
Recently stayed at this Best Western in Grants Pass. Despite being conveniently right off the highway, this cozy hotel was neatly tucked away and was surrounded by beautiful natural landscaping. Outdoor pool and hot tub were clean and provided a much needed soak for my road weary bones. Breakfast was standard and well stocked. The rooms were spotless, and the showers were fantastic! Front desk staff was friendly and personable, and got us into our rooms in no time at all. Just a short stroll to many restaurants, grocery stores, shopping, and gas stations. 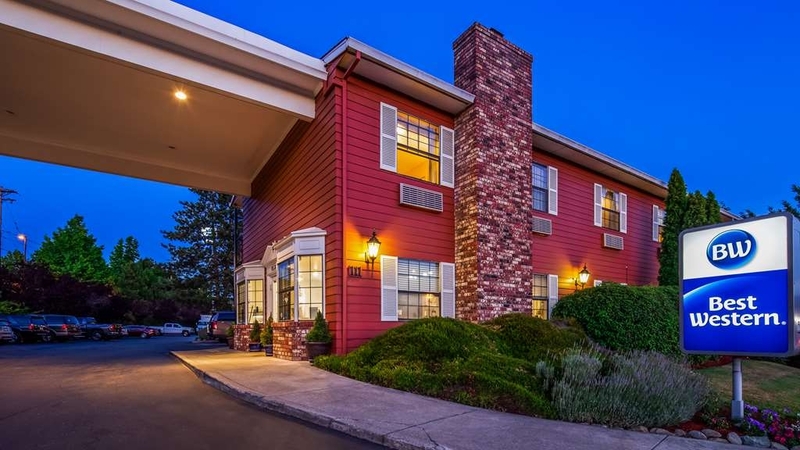 Can't wait to visit this Best Western in Grants Pass again, and you should give it a shot too! First time checking in at a best western, the front desk staff were awesome. Two ladies that were helpful, friendly and humorous. Great personalities for front desk help. Very efficient in getting us a nice room without reservations. No hassles or problems with explaining the routines of checking in. When we were there a lot of the rooms were being updated. The room we were in was already updated and the results were very good. Room and restroom very clean. Breakfast very nice with a good selection. Staff very courteous, friendly and helpful. This hotel is located near highway so it is noisy. It was also under renovation so I am unsure whether the renovations will cut down on noice. I could also hear the neighbors TV all night. Bed was hard. Door had a gap between the floor and bottom of door, about 1/2 inch. That being said, excellent breakfast, very nice staff and clean room. As soon as I got out of my car here I encountered a white supremacist. I wish I were joking. It was unclear whether the supremacist was an employee or guest. Welcome to Grants Pass, indeed. The receptionist was friendly and competent but seemed twitchy and gave the impression of recent or past drug use, so that was bit awkward. The room itself was OK, but the AC/heater unit was clearly ancient and in dire need of a deep clean. It did, however, have a fan-only option which I like and wish all hotel units had. The bathroom reeked strongly of cigarette smoke, and the vent wasn't working. Upon check out, the receptionist (a different one from the night before) had stepped right outside the lobby to vape. I've never found this town impressive. This hotel, sadly, lives up to all of my negative stereotypes about it. There must be something better around here. Should have gone up the hill to Holiday Inn Express, this property is dated dirty and the staff is less then stellar in customer service. When a property is a non-smoking property staff should go somewhere else to smoke, not outside front door. "Great experience at a sad time"
Exceptional hotel! Staff was amazing...very personable and knowledgeable. Had originally planned on staying 3 nights but when circumstances dictated leaving a day early, that was easily and quickly accommodated. The breakfast was very good as well! Had a family emergency, hotel staff was accommodating and wanted to make this trip easy for me. Our room was comfy and spacious, breakfast was hot and had a variety of foods, we will stay here in the future for sure! "The Best Motel we've found in Grants Pass"
The personnel were exceptionally friendly and helpful, as well as very efficient. The price for the room was very reasonable. The room was clean, with comfortable beds with sheets that fit. Our only problem occurred in the morning when we missed out on the hot breakfast due to a misunderstanding (on our part) as to the cutoff time...0900, while we thought it was 1000. Oh well, it was still a very nice place to stay...and the best of our many times overnighting in Grants Pass. Conveniently located just off the I-5. Our room was on the side that the reception lobby is located and was very quiet in regards to traffic but the walls were not very soundproof (not a big issue). Clean, spacious room with coffee maker but no fridge or microwave. Comfortable bed. Good wifi connection. Ample parking. Several restaurants within walking distance, two had 10% discounts for hotel guests. Had a good meal at Elmer's. Reasonably priced. Recommended. Superior customer service. Super duper clean rooms. Recommend 100% to stay here. I would gladly stay here again. Continental breakfast was good. Friendly staff in the lobby. Clean rooms and clean lobby. "Nice place to stay in Grants Pass"
A good place to stay for Crater Lake National Park visit. There are many shopping center closed by such as Walmart ... ect. There's also a in-n-out on the next exit also. I find the price for this location is much more reasonable than the other Best Western in Rorge River. We stayed 2 nights in the Best Western. It is an older property, but seems to be well maintained. The staff were very courteous and were able to answer questions about the area also. The Breakfast is a normal Best Western Breakfast, but the Biscuits and Gravy was really good, not too salty. The scrambled eggs were not overcooked and were good. The sausage they used is a good quality food. Overall, a good experience. We enjoyed our stay at this hotel, but rooms could definitely use updating. Although the rooms were clean, they felt "worn out." The bed was not as comfortable as other Best Western hotels and the carpet and furniture were old and dated. The staff, however, was very friendly and welcoming. Parking was easy and the hotel was conveniently located. "Great Place to Stay While in Grants Pass, OR"
Overall, I rate our 5-night stay a wonderful pleasant experience due to the quality of the hotel and the professional staff. The hotel is appealing both on the inside and outside - and the lobby has been recently remodeled, has a fireplace and is clean and inviting. Ample hotel parking lot - and a full service restaurant and bar/lounge is adjacent to the hotel property. This hotel is getting a little old, but clean. The bedding was great. Close to the highway..easy access in and out, there was some road noise, but it didn't really bother us. Elmer's restaurant in the same parking lot...good for a late evening dinner. We chose Grants Pass as a half way stop on our drive from Sacramento, CA to Seaside, Oregon. We randomly chose The Best Western Grants Pass Inn and were pleasantly surprised at the efficiency and professionalism of the young staff. The hotel is decent and clean. I would stay here again when traveling on I-5. "Very nice room, location a bit noisy"
The room we stayed in was very nice. Great layout with the bathroom and sink area around the corner from the bed. Shower was great with a very tall shower head! Super comfy bed although the pillow cases seemed kind of rough. Our biggest issue was noisy neighbors. And the location is right near a busy intersection so there was quite a bit of traffic noise as well. "Nice but leave curtains closed"
Overall, good stay and clean comfortable rooms. Problem was the morning we were leaving, went to breakfast and when got back to room, motel maid had it completely broken down and we had not checked out yet. I had opened the curtains to let light in and she looked in and thought we left. it was 8 am.! In town for a dental procedure and not feeling well. Stacy checked me in quickly and even brought a TV channel guide to my room even though it was freezing outside. Room could use a carpet upgrade but other than that the room was very clean and bed was comfortable. All employees I encountered were very friendly. We were travelling a long distance and stopped here to rest for the night. The service was good. Staff were friendly. The breakfast was very good. The only downfall was the truck noise from Hwy 199. We had a problem with the t.v. volume but too tired to report or deal with it. I'm sure if we had reported it they would have taken caree of it. "Stayed twice when passing through"
Lovely stay at this location. Rooms were modern and very clean. Bathroom was great, no issues, new and clean. Breakfast in the lobby was excellent, lots of choices for us and the kids. Staff was super friendly and helpful. We will be staying here every time we make the drive from Ca. to Wa. (About twice a year). Right off the highway but no vehicle noise. The restaurant right next door was yummy. Lots of parking. "Best Western Grants Pass Inn,"
I am graded this BW Grants Pass Inn 2 stars because request microwave and downstairs. BW cannot provided it. I told the staff my baby need to microwave in the night time. The Staff told me lobby open 24 hours. I can come down to microwave middle of the night. Do you think you would walk downstairs with cold weather and microwave the milk? impossible. on that night. My baby was drank cold milk and she got stomach ache and cried all night. My husband has had several doctor visits in the Medford and Grants Pass areas and since we are coming over from the coast we like to stay the night. 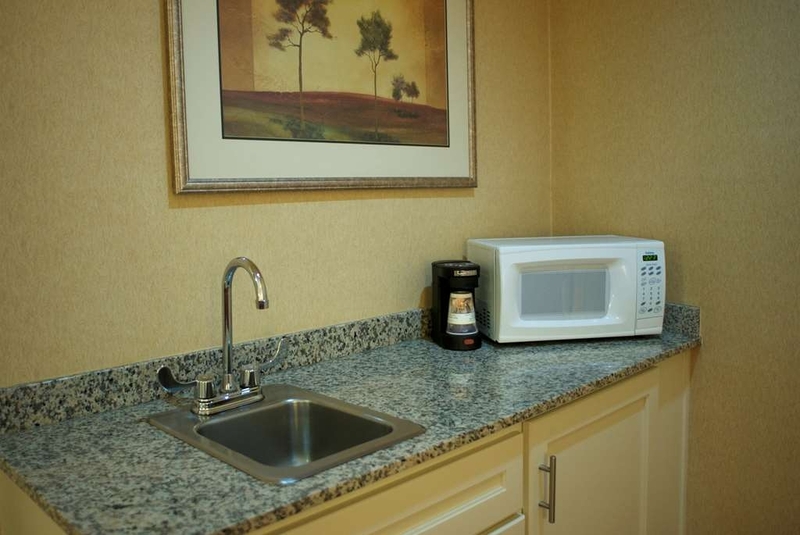 We like Best Western in both locations for the convenience of a restaurant right next door! Added bonus is a great staff! We booked here because it was pet friendly and we had our small dog along on the trip. What we found was that they were also very helpful, 'over and above' I would say due to the fact that their systems were down and they had to do all reservation paperwork by hand. They went out of their way to ensure their internal problems had no affect on our stay. And it didn't...except to appreciate their attitudes all the more for their extra effort. 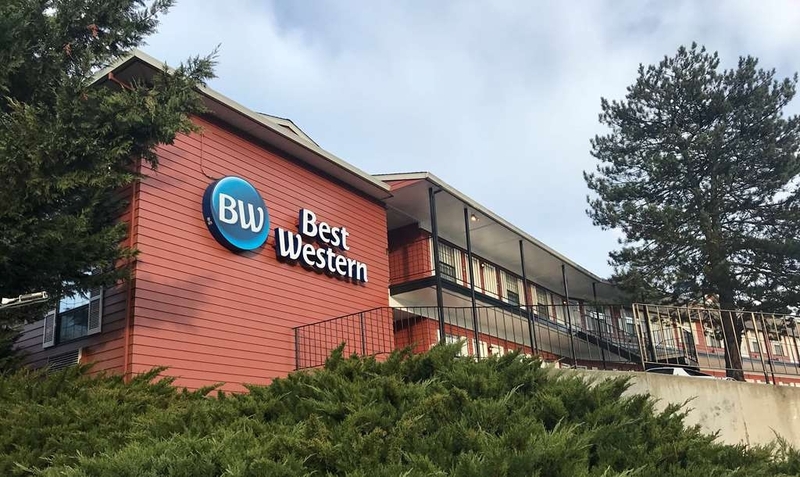 "my last stay at best western grants pass oregon"
made a reservation one month in advance, at time of check in ,i was told that someone was already in my room . i was told to take the room that was available or find another motel. staff was not helpful at all. This was our first stay here . Everything was fine, not exceptional, except the restaurant, it was recommended and. Exceptional. We may stay here again in March on our return to BC we Derby give the property a perfect score as a BW motel never rates one from me. Flying through in our personal airplane and had to spend the night due to destination weather. Convenient location. Nice appearance. Nice quiet room. A great self-serve breakfast with a good selection of breakfast foods.The very friendly staff picked up our dishes as we finished with each item. They brought us our own pot with the coffee of our choice. Leaky bathtub faucet that ran all night, filthy towel in my bathtub that I was scared to touch but had to move so I could shower. So many fruit flies in my room that I couldn't eat the salad I brought to eat. The room was stinky. The location was horrible, right off of the off ramp and all I heard all night were trucks breaking as they came off the freeway. Honestly one of my worst experiences in years. The first clue that we should walk out the door was at the check-in desk where a group was disputing charges and accommodations. That group left and the desk clerk immediately called the the day manager (possibly supervisor) to say there would be a situation the next morning. The clerk did not make this call out of our hearing range although he did walk away and excuse himself. When he returned he was clearly unhappy with his job choice as he shared he just received his bachelors degree.We spoke of the 'situation' and I showed empathy for his position. I let him know we would need a two bed room with refrigerator and microwave; he said they were getting full but had a room at the end of the building upstairs. The room was not where he had gestured resulting in my driving around the building while my daughter walked to locate the room, opposite the lobby. Room had no fridge or micro and there was an ashtray outside the door where a man was smoking. I walked to the lobby to let the clerk know there was no fridge or micro as requested, he looked on his computer and told me there was no note of that in the reservation. I was just there speaking to him directly! He said he would move a fridge to the room I said we will just leave he said oh no I'll just lockup and bring you a fridge. If they were full why was he able to move appliances but not us? He brought the fridge but by that time the smoke was intolerable so I said we would leave.At some point he said they only had suites, this was not given as an option for us. When I got to the lobby he was on the phone to the day manager/supervisor about the 'situation.' I truly don't believe we were the problem. We found this motel to be great for a last minute late night stop over. Front desk attendant was very helpful and friendly! They found us a room non smoking and it was clean and adequate for anyone nigjtn stay. Breakfast was also included but standard fare for a quick motel bfst... would stay again for a quick overnight but nothing longer. "Check to be sure towels and sheets are clean"
Bed sheets had not been changed, we found a paperclip in the bed. On wash cloth had been 'air dried' hanging up and not washed. Noisy parking lot made for a noisy room. The bed was comfortable but firm (for those who can't do firm). Only two towels in a jacuzzi, king room that was supposed to have a sofa bed too. No sofa bed, in fact, no sofa at all. Disappointed. 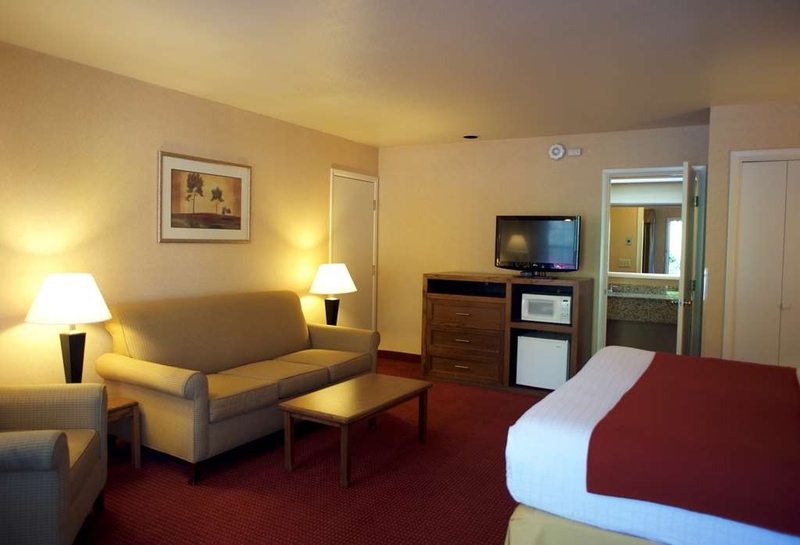 "Best Western Grants Pass OR"
Easy place to stay with very clean, quiet rooms and helpful staff. Will stay there again if in the area. Staff even ran upstairs and helped me with my suitcase when they saw me struggling to bring it down the staircase. From the moment we arrived staff were friendly, knowledgeable, and really cared about our stay. Rooms were good, clean, and had everything needed for a pleasant stay. Staff even mentioned discounts for local restaurants. Breakfast was good, plenty of food and packed with lots of travelers. We didn't have enough time, but hope to use the pool/hot tub on our next visit! The only down side was the travel noise as driver's exit the freeway. Otherwise pleasant stay! "Good location and decent enough for the price." Good location, just off interstate 5. Necessary amenities within walking distance. Outside of hotel is very tidy and well maintained. Two restaurants next door offer 10% off as a hotel guest. Average rooms, decent linens, comfy bed. Sadly no microwave or frig. Fast internet. Good cable selection but room needed a TV guide or channel guide. Staff very friendly and helpful. Breakfast not great and it's actually gone down hill since I stayed there a year ago. Guess all the money went in to the lobby renovation. But I would stay here again for all the other reasons I mentioned. Friendly, competent staff; clean room with very comfortable beds; great breakfast; located near restaurants, fast food, WalMart, Rite Aide, etc. ; very easy freeway access; even though the hotel seemed to be almost fully occupied and the location is near a freeway and busy shopping area, my room was nice and quiet. The hotel was very clean. The room was very quiet. Hotel staff were very helpful with information about the area. The breakfast area was kept well stocked. The hotel was easy access from the freeway but there was no noise from the freeway. Near the freeway, right next to two restaurants, decent wifi, reasonable price, no fridge or microwave in my room- "Just in suites...". Room is clean, small flatscreen TV, decent cable. Able to park near my door, old motel style. We will NEVER! stay here again. It is just a few hundred feet from I-5 and is so noisy that I went out and purchased ear plugs. The accessible room that we had was almost a block from the breakfast area. We had to drive to breakfast because I can not walk that far. "Worst stay in a Best Western"
Worst stay in a Best Western to date. Upon arrival a manager was working at the desk with a clerk. The manager was working in the corner of the angle of the desk and closest to the door. When I arrived she did not look up or recognize me but was checking figures between two sheets of paper. This meant that the clerk on the the left was the one who worked with me. When finished checking her numbers the manager spoke to the clerk, interrupting the check in process and walked away, never looking at me or saying anything to me. I was then told that they couldn't get me an upstairs room as they were almost full. This in spite of my making my registration over a month before my arrival. I then mentioned that I was a Gold member as the clerk did not pick that up and I hoped that having an elite status would help but that did not seem to make any difference. I then went to the room which I immediately sensed was both hot and had an odd smell. I also found that there was no refrigerator in my room. I walked back to the front desk and inquired about the lack of fridge. They told me that they only had fridges in certain rooms and that they couldn't do anything about getting me one that night. They did let me put perishables in the the central kitchen fridge but it meant walking back to the room to get them. I again felt the warmth in the room so turned the fan on high and the thermostat as low as I could. I left the room for several hours but on my return the room was about the same temperature. I realized that it was malfunctioning or just not powerful enough for the room. It continued to cycle off even when the room was no where near what it should be. I didn't bother mentioning this to the staff as my past experience told me that there was nothing they could to for me. So, like I said, not a fun experience at this hotel. "Not Great on This Trip"
3 stars is generous for this stay. We stayed here a few years ago and would have rated it a 5 at that time, rooms were clean, service was great, breakfast was above average for a "free breakfast". The very reason we booked here again. But not this trip. The good: The remodeled lobby was beautiful and the breakfast was still above average with a good variety. The breakfast staff was working hard to make sure everyone had fresh coffee and food, all the time in a friendly, professional manner. The bad: Although the rooms appeared clean the carpeting in one of our rooms was VERY noticeably filthy which makes us question their cleanliness standards. What does cleaning staff do when they notice a runway of dirt and huge stains all around a room? If management is made aware, do they do anything about it? Shortly after check in we made the front desk aware of it. Not once during our 2 night stay did anyone contact us regarding our concern. Mentioned it again at check out, same feeling... does front desk pass our concern on to anyone? If so, do they care? We then asked for the manager. Had him follow us to view the room for himself. We didn't get the friendliest vibe from him, but we were insistent he needed to see for himself. On the walk back he did tell someone to clean the carpet. He did offer Best Western reward points and then offered to discount the room instead. We opted for the small discount of less than 20%. I don't believe I ever heard an apology from him. We just felt as if we were more of a bother to him then anything else. Have to wonder if the carpet was really cleaned....Also, if staying here ask for a room on the pool side of the hotel. The street side had extreme big rig noise during the night. "Nice hotel fo a non- "plus""
We had a corner room on second floor that was quite large. Pool area nice, with heated pool and hot spa. Breakfast area cute and updated, but crowded like most BW's. Out of paper products when we first arrived, but quickly remedied. Very near the highway, very noisy in the rooms nearest. Clean, but quite a while since room we had has been updated. Hit and miss daily room care. No room mini refrigerator, micowave, or safe. The breakfast was quiet good as compared to others we experienced on this trip. If ever staying in this area again, would probably chose another location. This hotel (And Best Western) conned me out of $30 in rewards. Was on the phone with them for one hour. They are just bouncing me around, never dealing with my issue, never dealing with their mistakes. Never stay here. Staff was great, friendly and willing to answer/solve problems. Fixtures and furniture was dated. Outdoor pool was nice. Too much street noise in the evening. Location from restaurants and highway was perfect. "First horrible experience at a Best Western"
We have always been happy with Best Western Hotels until now. They checked us in without telling us that there was no hot water to the entire hotel. I cringe to think how they were cleaning the linens and kitchen. This is the worst hotel I have ever stayed at. First room (138) we went to was filthy, black mold in the shower, food on the carpet etc. Went to ask for a clean room and was moved. Second room (116) has cleaner carpet but stained furniture, stained pillow on the bed, pink and black mold in the shower and hair in the sink and someone else's pubic hair all over the bathroom floor. Gross. This location is horrible. We paid for two nights and rented two rooms and both rooms were crap. Our rooms were not cleaned during the entire day we were gone. Arrived back and called the desk to ask why and they said they do not clean the rooms unless asked. How does a customer know to ask to clean a room if they are not told. Front door does not shut correctly, walls are so thin you hear people talking as they walk by, no fridge, no microwave. Freeway noise is ridiculous... This place should be shut down. Awful, terrible, facility and staff working seemed like they could give a crap about anything. Have emailed management and Best Western my concerns and no response. This BW is right in the center of town, very close to restaurants and shopping. It is older but very well kept up and clean. They offer 10% off at 2 restaurants close by, no fridge or microwave though. Good rooms and very comfortable beds, quiet and clean. I did find a camera on the floor which made me wonder how well the room was cleaned. We were pleased after driving 8 hours to find this place. The staff especially Ashley and Cody were great! They made sure we were taken care of. The breakfast was good and Dawn did a great job keeping it filled. We stayed 2 nights and went on Hellsgate which was so much fun. Elmers next door was good and we even got 10% off our bill. We really enjoyed our stay. Our pet-friendly room was clean and up to date. A microwave and fridge would have made it even better. Pool, hottub and deck area was nice. Full breakfast options delicious. Staff were polite, friendly and very helpful. Overall a positive experience for our grandkids, dog and us seniors. This is a really nice Motel. The people are friendly and helpful and the breakfast is great. The rooms were clean and the area is very quiet at night. The Motel is easy to get to from the freeway and close to several eating establishments. I would stay there again when in the area. "Good if hot tub working"
Room was clean although the carpet needs to be replaced. The breakfast included scrambled eggs, sausage, biscuits and gravy, along with many cold items, fruit, juice, milk and coffee. I selected this hotel because it has a hot tub, however the hot tub was NOT working while we were there although we were not told this before we checked in. "Best Western, Grants Pass, OR." Great property but could use mini refrigerators in rooms for road trip travelers. Breakfast is excellent, very tasty, lots of food choices. This was my 5th stay at this property. I would highly recommend this Best Western. Usually stay at BW's when we can as they are always great except this time. Started off, our room wasn't ready at 3:40pm (40 minutes after check in time) and they said it would be at least another hour before it was clean. The room was lacking in lighting and there weren't any outlets close to the bed lamps and nightstand to plug in your phone to charge. The TV was small and sitting down low on a two drawer dresser. It was so low you could only see it if sitting straight up. There were only 2 wash cloths and we had 3 people in our room. The bathroom had some mold on the tiling in the shower but the tub was sparkling clean. On a positive note, the beds were very comfortable and linens were clean. The breakfast was ok, not the selection usually at other BW's, there was one person trying to keep it stocked and she seemed a little frazzled, but she was very kind and working hard! The rest of the staff we encountered were all very nice and working hard. I think BW could do a little better with this property especially for the price about $130 a night. the hotel staff at desk was caring and accommodating ...to meet our last minute needs...Cody and Ashley were terrific so was Dawn in the breakfast area...keeping it clean with a variety of food choices...keep up the good work!!! We had made a reservation and we know it's a holiday weekend, so room choice would be limited. But when we got to the room, the road noise was just too much. The hotel is older, but neat. And the front desk lady was really nice and helpful, but limited options. We ended up giving up the room and found another hotel nearby. no ice, dirty pool, nice people, good rooms. Temperature was over 100 degrees, and BW had no ice. Pool looked dirty. No play area for kids. Staff was wonderful , and the location of the motel is perfect. This used to be my go-to place in Grants Pass. It's declined greatly, and I won't be back. Our travel trailer was broken in to in the parking lot, things were broken in the room, towels had makeup stains, and the evening staff needs customer service training. Second year staying here for a week visiting family. The property is convenient to the interstate and also to downtown. Staff is polite and helpful and everything is clean and well maintained except this year their spa was out of order due to no heat . They were waiting for parts to repair it. They offer guests a 10% meal discount at either Elmers or Applebees. The motel was nice and clean. The pool was a good size. The bed was very comfortable. The location is near amenities. It is close to I-5 but I couldn't hear the traffic noise at all. The staff were friendly and helpful. Stayed in a spacious room on the ground floor. Quiet and clean. Large sink area but small toilet in bathroom. Clean and soft linens. 10% off breakfast at Elmers just across the parking lot. Located just off the freeway. Good place to stop for the night when on a road trip. Arrived and the front desk staff were extremely Friendly and accommodating to our special last minute request for a lower floor room. All staff we encountered such as cleaning and maintenance were all very friendly and specifically asked if we were enjoying our stay and if there was anything they could do for us. Everything was great and we were Very Pleased with everything! Also, the breakfast was unexpectedly delicious, so saved extra $$ I'd definitely stay there again and recommend! "Two luggage stands, great parking, super clean room"
Its pretty rare that a hotel room has two luggage stands. My wife and I always have to flip a coin for who gets the stand. This room had two which was such a nice little feature. Great parking and super clean room. Ive always driven past Grants Pass on my trips but this time we stayed for the night. This hotel is close to everything in town. Very positive experience!! We did not receive an Elite recognition at check-in. My wife and I had to change guest rooms two times. The first time was because our room was adjacent to I-5's traffic noise from the off ramp. The second move was because the guest room's toilet was not functioning at all. The staff couldn't get any maintenance person to respond to repair the toilet. All three rooms had an unclean musky-like odor that can be best described as the carpeting either needed to be heavily shampooed or replaced. However, we have to say that the staff were very apologetic and did the best they could to accommodate us. We give praise to their efforts. My wife and I have stayed at this particular Best Western in the past and have not experienced the guest rooms the way we had on this visit. We encourage Best Western to revamp all your rooms to a more clean, working order, odor free and fresh appearance including but not limited to insulating the windows for sound. "WORST BEST WESTERN EVER "
"Ok motel based, breakfast is a plus, powdered and hot cold fast. We stayed on the opposite side of the office where"
Ok motel because of visitors who hung outside their rooms chatting, smoking, and playing their radios outside the door of their rooms. Difficult to quiet them down even after reporting to front office. Did feel safe allowing children to move back and forth between rooms because of the appearance of these guys. Room was ok clean but not clean in corners. Would of liked it to be cleaner...may choose the next step up in Best Western motel next time although cost is considerably higher. Very soft mattresses... not comfortable for me. Excellent place to stay room was very clean and staff are excellent. I would stay there anytime we are going to Grant Pass Oregon. Close to shopping and Restaurants . They have a good free hot breakfast. Clean, conveniently located, great staff. Staff was very friendly and helpful at check in. The business kiosk was not set up but front desk helped me get a form printed. Close to the freeway and on a main street but quiet enough i had no problem sleeping. "good hotel in grants pass, oregon particularly if you are traveling with a pet dog." I have stayed in Grants Pass, OR Best Wester for about 40 days in last 6 months. The hotel is pet friendly and is clean and the staff is friendly and helpful. They offer a good hot breakfast and have recently remodeled the breakfast area. It is attractive and clean. I recommend this hotel to anyone traveling to Grants Pass Oregon. The rooms are basic. I was surprised to see that there was no refrigerator or microwave. The toiletries were minimal. I have had more at other Best Westerns. I wasn't sure if the breakfast had low fat, low sugar or gluten free options. If there was it wasn't easily noticeable. The hotel is located right off the freeway. The room was not insulated from the noise. If there is another Best Western in Grants Pass I would definitely suggest it as a substitute. Love Best Western just not this Best Western. "We unprofessional Evening Desk Clerk"
Richard the evening Desk Clerk is there you need to turn around and run. Because he will do nothing but make you stay very miserable. Reserved a King room about two weeks in advance, then even call to tell them I may be a late arrival getting there. That didn't help because he said they didn't have a King room, even though that was what I reserved. He said he had one but he would have to go and check and see if it have been cleaned. Instead of going and seeing he just stood there and tried to give me BS about what I had reserved. Then the next day the didn't even clean the room, then he wanted to tell me that they don't service the room if you stay more than 2 nights, which is BS I stay in motels on business about 265 days a year and this is the first time I have had someone try to lie to me about what is done with the rooms over 2 day stay. So Like I say if Richard is the person on duty run don't walk from this Best Western Motel. We usually stay at Holiday Inns when we travel. This was the only one that didnt meet our expectations. It wasn't as clean and welcoming. It wasn't clean on the outside, either. It needs to be cleaned up and painted. The key didn't work even after they "tried" to fix it. Phone, ac/heater, jacuzzi jets didn't work. Paper thin walls heard everyone all night, poor quality bed. We arrived at 2:45 and the room wasn't even ready until almost 3:30. Very disappointing and a waste of money, will NOT recommend to others. We brought a friend to town to visit a family member in end stage cancer. While she was visiting we then drove over to the coast. 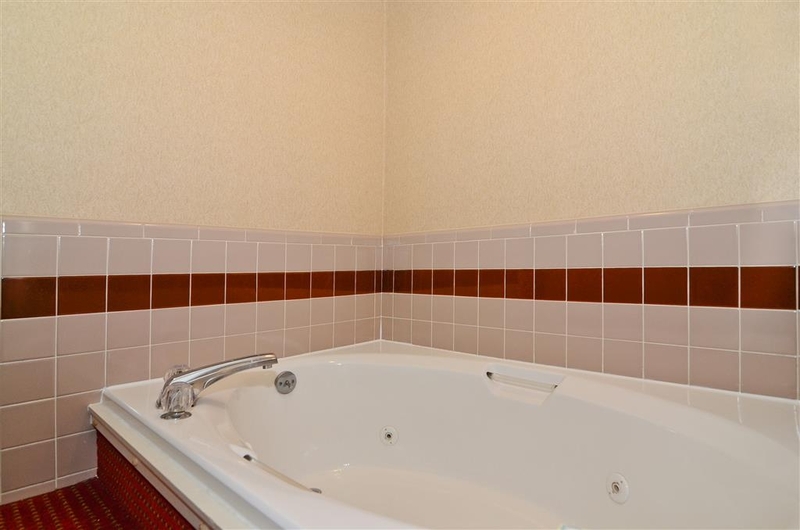 The room was easily accessible, we were pleasantly surprised that we had a jacuzzi tub! Room amenities very nice. Comfortable bed. Couch a nice feature to relax after a long drive. Breakfast a nice selection. Staff friendly and courteous. Quiet area. "May visit to Crescent City"
"Not up to Best westerns standard"
If you're expecting this Best Western to be up to the Best Western standards look again this Best Western is nowhere near the best western standard. it is more In the line of Motel 6 standards. So if you're looking for a Motel 6 at twice the price stay here. "A good port in a storm (no reservation)"
Best Western's sign from the freeway is always a welcome sight. My sister and I had booked at another facility in Grants Pass, but were disappointed to find that the management there was not honest about their pet policy (small dogs allowed, but extra charge for our hound and the same price for the parakeet). So we declined and headed over to the Best Western. Happiness. The staff were the happiest employees I have ever seen. They went out of their way to make you feel welcome. The rooms were clean, the bed comfortable. The only downside is the road noise at night. The lobby coffee was a perk! "There are other options. Better suited for the on the road working type. Truckers, salesman, etc"
Walls are thinnnnnnn. Could hear the smoker next door hacking all night. Road noises and freeway noises, entrance poorly lit or not at all. Stains on carpet. When I told managment responce was something about maintenance crew. Ice machine emptied by small ice chest. Booze party on south side that night with room door open. Animal friendly and adequate breakfast. Friendly staff. 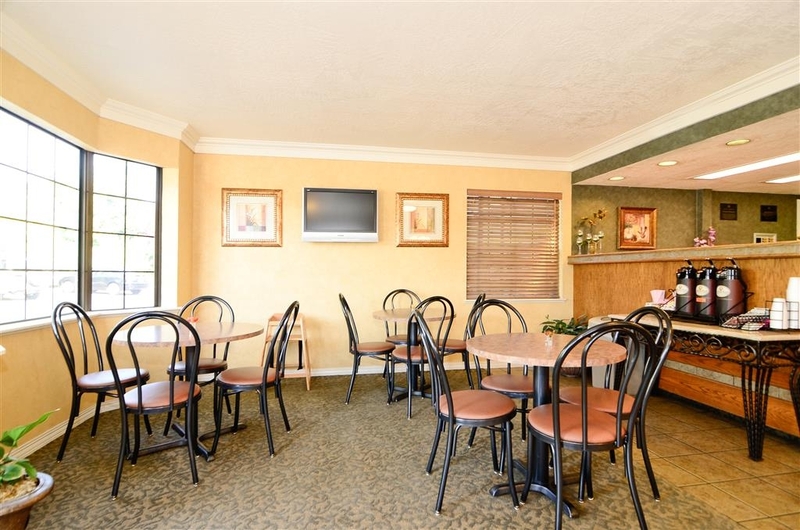 "Terrific Value for the Price"
This hotel is situated right off of the freeway and has restaurants and other shopping in the the surrounding area. It is a bit older, but the cleanliness of our room, the exterior and lobby/breakfast room was exemplary. The staff is friendly and met our requests without hesitation as they fulfilled them. The breakfast is good, and the area is kept clean and well organized. I've stayed in this hotel many times because I visit friends in Grants Pass. It always feels like coming home. The accommodations are always clean and in good working order. The beds are comfortable. It's close to the freeway but I've never heard the noise. The grounds are always clean, which I appreciate since I usually have my dog with me. They are very dog friendly. Did. It have a reservation when we showed up at the hotel but they were very accommodating in having a room for us. The breakfast left a little bit to be desired but understand because they're remodeling the breakfast area and lobby. Staff was very nice. Would stay here again on my next vacation. Great internet, comfy beds, but loud guests coming in at 1:45 AM waking several other guest rooms up! When mentioned in the morning to the front desk, they said they would try to find out who it was. Seems they need to manage noise better to start with. Lobby under renovation, so no breakfast eating area. What are the odds that my wife and I would stay at two consecutive Best Westerns that were being remodeled? I like Best Westerns. They're almost always nice, pleasant places to stay. Including the Grants Pass Inn. We were given a nice, very large, quiet room on the upper floor, away from the freeway. The bed was comfy, and the price was right. Unfortunately, the lobby and the breakfast area were being remodeled. So there was no breakfast available. Instead, they gave us a choice of a breakfast-to-go bag, or a discount at the Elmer's next door. We chose the Elmers. The lack of a free, hot breakfast the ONLY negative I could come up.with. we live on the coast and go to medford at least every 3 mos for doctors' visits. we've always stayed in medford, and in our travels usually stay at best western. so we thought we'd change things up this trip and stay in grants pass at the best western. i'm glad we did. it was a nice change of pace from the busy-ness of medford and afforded us the opportunity to visit some different eating places. the staff at the hotel were very pleasant and friendly. the hotel was undergoing some renovation so we picked up our breakfast to go in a brown bag, according to our selections on a check list, which for us included bottled water, yogurt, an apple and blueberry muffin. the room was comfortable, bed, shower, lighting, etc. but the tv - oh wow - it was a flat screen with a 3-inch black border around the entire picture area, which made for a very small viewing area. due to this, we actually didn't spend any time watching tv. "Great hotel at great price"
This is a nice hotel at a great price. It's close to everything in Grants Pass and always enjoy the staff's helpful attitude. It's close to restaurants, gas, and the freeway. We've stayed several times and the staff is helpful and the breakfast is great. Stopped off on our way nome. Easy access off of I-5 via exit 55, northbound or southbound. The room was on the north side, first floor. It was comfortable and spacious enough. The usual BW amenities. Very quiet. We had a good nights sleep. Breakfast was the standard fare, cold cereal, or eggs with bacon or sausage links, etc. The breakfast area is small, but staff told me that it was going to be remodeled shortly. I trust at the same time they get a new breakfast nook TV, it;s disconcerting to only see the top portion of a broadcast. (minor complaint that wouldn't stop me from coming back) Elmer's restaurant right next door. "Grants Pass Inn Is in the Best Western Tradition"
After a long day on Interstate 5, we selected the Best Western Grants Pass Inn because, well, it is a Best Western. After decades of motor travel, we never have been disappointed at a Best Western, and the Grants Pass Inn did not disappoint. We arrived without reservations and were quickly accommodated by a friendly and well-trained staff. Our room was spacious, clean and meticulously prepared. The beds were exceptionally comfortable as well. After a quiet and restful night, we were pleasantly surprised by excellent breakfast choices in the motel lobby. There were hot eggs, bacon and sausages as well as a large array of baked goods, fresh fruit, yogurt and cereal, plus very good coffee and juices. Bottom line: We'll be back. "Let us have our cat!" We were in a pickle! Had a little over a month between moving out of sold house to new home. Needed somewhere we could have our cat. Couldn't even find a vacation rental in the area that would accept cats. Best Western ROCKS! Room was very spacious, bed was comfortable and the breakfast was decent. Breakfast selections were varied, with hard boiled eggs, cereal, yogurt, French toast, etc. the room was quiet - no noise from nearby I-5. Staff was very pleasant, and the price was good - under $80 on Orbitz. The bathroom seemed a bit dated, but was very clean. Carpet seemed new. Unit A/C was not overly obtrusive - slept well with little noise from the A/C. "Stick with what you know !" We had a spur of the moment trip to Grants pass to see our kids ,I though tI would try something different , well I initially booked 2 nights a the Riverside Inn. BIG MISTAKE !! that room was so disappointing (review on that one soon ) that I Ended up changing to BW for the second night and I'm so happy I did. The room was clean , spacious and had good breakfast . It will now be our go to place when we come visit ! "A good stop along the way..."
We were on a two week trip to explore the Oregon Coast, stopping every night. We saw whales, elk, and a lot of friendly people along the way. We stopped each night and searched out a Best Western, mainly for the known product. We usually get a good room and a very nice breakfast before returning to the road. We were usually not disappointed. I stayed at the Best Western in Grants Pass in early October. The room was clean, and the bed was nice. The location is right off of I-5. The convenient location also comes with the road noise from the highway. Not the hotels fault, but it can be loud with sirens and older children on motorcycles. The breakfast was nice, with the standard hotel menu. Nice hotel, but next time I'm in Grants Pass I will try for a more peaceful venue. This hotel looks decent from outside, and in the lobby, plus the swimming pool is nice. That's about all BW Grants Pass Inn has going for it. The rooms are in major need of an upgrade. The wallpaper is peeling, and the beds are very uncomfortable. The king room with jetted tub is spacious and has a nice separated toilet/shower area, but our "non-smoking" room had the distinct smell of smoke. I overheard the desk staff explain to another about their "$15 fee for a pet in no-pet room" and how they sometimes allow pet owners to stay in a non-pet room rather than turn them away if all of the pet rooms are booked. I imagine they will do the same for smokers, which defeats the purpose of a non-smoking (or non-pet) room. The full breakfast was not very appetizing. All of the food was in warming trays, but not very warm, and wasn't very well prepared. The scrambled eggs were basically like an omelet, but with a slice of American cheese folded in the center. Definitely NOT worth the $140 we paid for one night's stay. "Not much for what you"
"Don't expect to sleep well"
Bring earplugs if you expect to sleep. Thin walls and badly insulated doors and windows. Street noise from the freeway and busy nearby streets and party sounds from surrounding rooms come right in. Wouldn't consider staying here again. We drove from Washington and stopped at Grants Pass before heading further south. This hotel was a nice place to stop and rest for the night before proceeding to California. Winco is literally next door as well as a Starbucks. There was a restaurant/bar&grill next door with a discount but we were too tired and just went to bed after snacking. 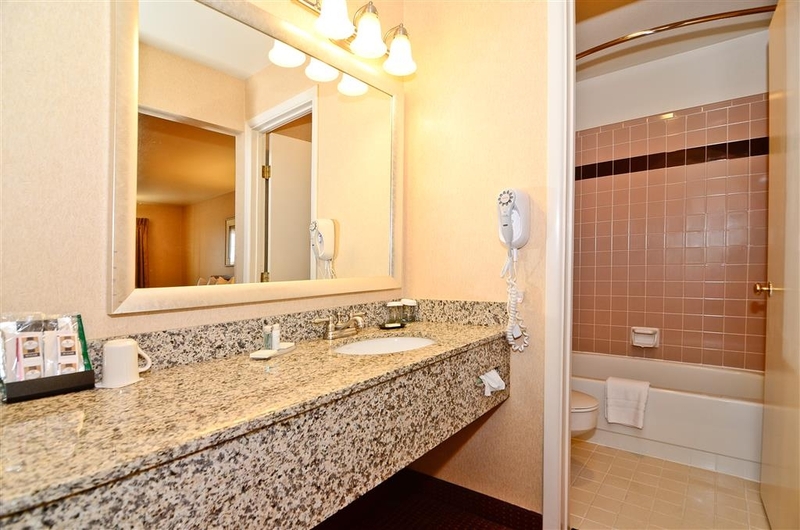 Nice size room with toilet/shower separate from dressing area/sink. Ask for a room away from the street side, as noise from early commuters in loud trucks was a problem for us. There are several buildings, so getting a quiet room should not be a problem. Freeway noise is not an issue. "Best HOT TUB in town"
This hotel was perfect it was close to everything the beds were the best and the Hot Tub was the best we've ever had.... Love Love, Loved it The breakfast was good and the beds again were like big over grown pillows. Staff friendly, amenable to correcting any issues, complimentary newspaper. Bed very soft. "Hot tub" is a jetted two-person tub (depends on your definition of hot tub). Quiet. No noticeable odor of smoking outdoors. Next-door restaurant, Elmer's, serves typical American menu with good prime rib. Did not use breakfast service so can't comment on that. Right by freeway access. Very friendly staff and excellent location. Room faced the I-5 and still slept like a baby. Hotel is a little dated and could use some updating, but overall everything appeared very clean and the beds were comfortable. The complementary breakfast was decent and satisfied us for a long journey. Very Nice place to stay. The poop and spa are a nice touch. Walking distance to restaurants. Check out staff was very helpful. Only suggestion would be to have another person working during check in times. We were driving from Seattle to Redwood national park. This is hotel is next to route 199. Walmart, gas station, and many other stores/restaurants are near by. They offer hot breakfast also. At lobby they also have coffee, tea and hot water. Check in and out was fast. We arrived early, my husband was very tired from driving, only had to wait 45 minutes to check in, the restaurant by the hotel provided a take out lunch, which was nice. After we left they called to say we had left a cane, I asked if the would ship it and they did. Received it today. Very happy. Sorry to say this will be our last time at this Best Western. The pool and staff and breakfast was fine. However, the building is old. As a result the walls are paper thin, we heard everyone above us, on both sides of us and behind us all night. If they could add sone sound proofing it would really help. The rooms were clean, and is what you expect for the hotel class. 2 queen size beds fit the room. There was no fridge though. There was no fridge though The staff was friendly. There's a lot of places to eat around the area. "Hotel right on busy road!" Average hotel right on a busy road, which normally would not matter but that the hotel is older and needs some renovation. We had the room right next to the road and you could hear every car going by. At about 3 am our neighbors decided to turn on the TV and we could hear that too! 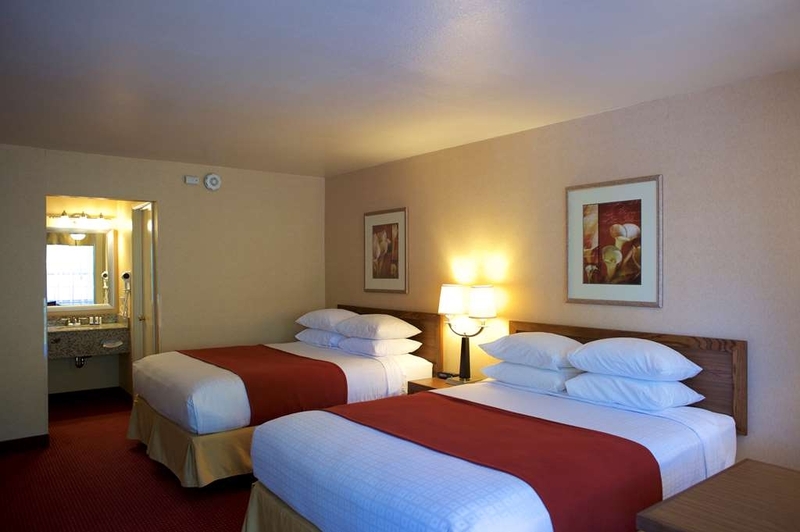 The hotel is located off Interstate 5 with several Restaurants and Food stores within 5 to 10 min walking distance. Room was clean and staff friendly and helpful. Good internet speed. Good place to stay to experience Grants Pass. "large room and price was right"
Check in was fast and easy and we got a room on the top floor. Only 2 floors here, so no elevator, which is a bummer when you have a lot of stuff to bring to your room, which we did. The room was large and had a great king size bed. We got a good nights sleep for a long drive the next day. We didn't try their breakfast, but at check out, it looked very good and there were a lot of people in the lobby enjoying it. Maybe next time we stay here. Right off the freeway, great location, has a nice pool area. We were very satisfied with our stay. They have a good restaurant with lounge next door, you can walk to. The only complaint would be a small breakfast area with limited selection. Room = old, bed = hard, mirrors/windows = dirty, wallpaper peeling from wall, noisy traffic all night, pool closed for cleaning on 100 degree day. Will not stay here again. Will not recommend this hotel to anyone either. "good hotel, large rooms and satisfied breakfast"
"Port Angeles to Grants Pass for the night." this hotels clean and the price was right beds are comfortable air conditioner works in a Quite room. Best western hotel recommends the restaurant across the street with 10% discount. I recommend the clam chowder chicken Quesadillas as a snack when you're not really hungry. Older facility; I stayed here over 12 years ago. Smoking rooms on first floor. Staff very helpful, especially as we needed medical assistance. I don't do stairs well, and staff offered to help with luggage as only room was on second floor. I would stay again. was on 1st floor facing road and restaurant. very noisy. Room was very clean. liked having microwave and refrigerator plus coffee maker. would have liked HBO, Stars, and more stations. Would like to have better shampoo and conditioner containers. We had a group of 7 people that stayed at the hotel. We attended the Rogue River Excursion. The hotel was in a great location and all the group was very satified with the stay. We would highly recommend Best Western Hotel for a great experience. nice location and beautiful view of the mountains on rogue river, comfortable beds. The Hot Tub could be warmer. The breakfast area was nice and clean and large enough to get around the food was fresh. "Stay here if you want other peoples hair!" Absolutely disgusting!! Hair all over the bathtub! Nothing special but a hefty price for a no frills room. Not one item that was even near worth $136 discounted, yes that price was the discount. Can stay at a super 8 for same room but a quarter of the price. "failure to follow through with guaranteed Government per diem rates"
The manager refused to charge Federal workers the guaranteed GOVT rate of $89/$99 per night. Instead she charged us full price of $139/$129. Another crew stayed at the Holiday Inn Express next door and enjoyed an overall better experience for the same price. I will never stay here again and would advise fellow travelers to avoid this hotel if at all possible. Staff was very friendly, minus the manager. Justin and Cody made our crew feel very welcome and were extremely friendly. Failure to follow through with promised rates really caused a lot of headaches for my purchasing agent and myself. 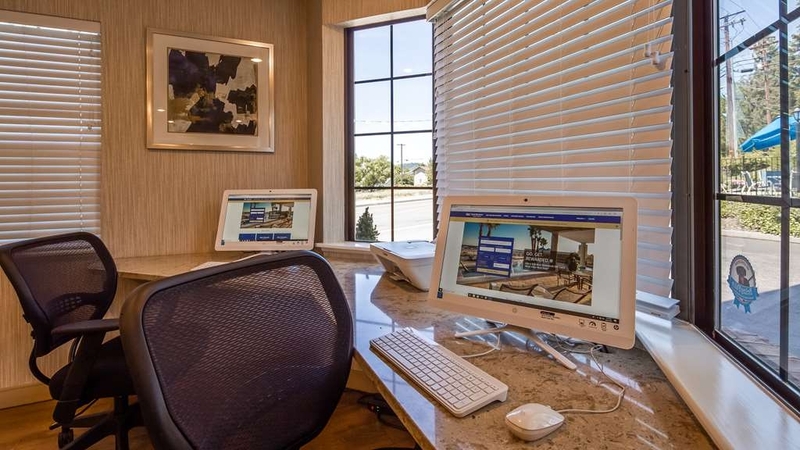 You can get a lot more for your money by staying at the Holiday Inn Express next door. If you are staying at this motel because it is cheap - just know the price may change at time of check-out. This is a typical motel-style property, probably built in the 1970's, but beautifully maintained. Outside entrances, parking right outside your door. Our room was huge, with the most comfortable king-sized bed of our week on the road. Very nice bedding. The bathroom, however, was tiny, but we had a nice long granite vanity. No microwave, no refrigerator. A nice convenience was the Elmer's restaurant, literally in the parking lot, offering a 10% discount to Best Western customers. Breakfast was above-average--we enjoyed moist, still-hot, French toast. This motel is immediately off the freeway--easy to find, and easy to get back on the road. We're glad we stopped here. "Nice place for the price"
Room was clean. Bed comfortable. Staff VERY pleasant and accomodating. We were supposed to have a fridge and microwave - wasn't in room. So, they brought them in. Coffee maker in room. Soap, conditioner, and lotion of decent quality. Bath very clean and easy to use. Would not hesitate to use again for my stays in Grants Pass. The only negative is the proximity to the freeway, however noise was not an issue, even at night. "Don't stay at Best Western in Grants Pass !" While I did not believe the cost of the room to be overpriced for what I would expect from a Best Western, in hind sight, I certainly think it was way over priced for what we got. The rooms were very loud, the street traffic was horrible, and the bathroom still had hair in it from the previous guests and was so small you could barely get in the door and shut it. We won't be staying at this one in Grants Pass again -- EVER. "Good Quality at Fair Price"
Overall the room was nice and clean. Reasonably priced. Noise from highway in front was problematic at times. Breakfast was nice, but seating was limited. Internet was quick to respond. Located next to shopping area if you need to pick up supplies. Restaurants within walking distance serving standard fare for travelers. The hotel stay with my Dad was Awesome for my Dad's first time at the hotel, he was very happy with the stay. He Loved that there was a smoking room for us to stay for the night. He was a little shocked about the full hot breakfast. Clean, smaller motel. Friendly staff. Great breakfast. Close to many services. No microwave or refer in room. Good TV channels. Easy access off freeway. Had a good feel about it. Would stop again if traveling through. The staff was friendly, rooms were ok for a quick stay, decent location. We did have a family come in and their baby cried all night long. Unfortunately I did not get to enjoy my sleep. I could have told the staff, but thought it was a mute point. I'm sure the staff could not make the baby stop crying. "Excellent Outdoor Pool & Jacuzzi!" Nice and helpful staff (especially the woman from Indianapolis and Justin), even during a very busy weekend stay. Outdoor pool and jacuzzi is in a pleasant setting with a view of the mountains and nice decorative landscaping. Complimentary coffee and tea selection in the reception area is of a good quality. It was a very enjoyable stay! "Comfortable stay but the hotel room needed upgrading." We stayed for one night and overall the hotel is ok. The staff were all friendly and the young man who checked us in called to see if we needed anything after we got into the room. The temperature outside was 98 degrees and the room was very cool and the AC worked well. The room faced the west so the sun was rather hot and we had to keep the curtains closed and turn on the lights before it was dark outside. The bed was comfortable and the pillows were soft. They had a small flat screen tv but no channel guide. The hotel said they had HBO but the direct tv message on the screen said it was not on the plan so you couldn't watch it. There were flies flying around in the room and it took all night to kill them all. The toilet and shower were in a separate room and the door was extremely close to the toilet, bearly clearing it when closing it, so you had to fully step into the room close to the tub before you could close the door.The bathtub looked clean but the grout tile was pink in spots which indicates mold. There was no fan in the shower/toilet room. There was a cracked tile on the bathroom floor and patches on the wall paper. They should switch to low flow toilets. The carpet was an older pattern and the floor creaked when you walked in certain spots. The hotel guide binder had holes in the front cover like someone melted it. There are smoking and non-smoking rooms next door to each other so you can smell the cigarette smoke at times. One good thing about the hotel is the hot breakfast they offer in the morning until 10 am. Another good thing about the hotel location is its proximity to restuarants (Elmers) with good food. They also give a discount on dinner when you show them your room key. Luckily we were in an inner room so the noise from the street was not an issue. For a one night stay it's ok but I would have to seriously think about staying here for a longer period. Decided to stay here for an overnight pit stop between Seattle and the Bay Area. We were assigned to a ground level room on the south facade of the building which shares a parking lot with a restaurant and bar. This made me nervous at first, not knowing what type of folks were frequenting the bar that night, and if there would be any parking lot shenanigans right outside the door. Being a Sunday night though, everything turned out fine (Bullet #1 dodged). A little bit of traffic noise, so next time we'll be sure to request a room on the opposite side. Biggest issue with the room: The walls and floors are SUPER SUPER thin!! Lots of footsteps on the floor above us. Clearly heard the neighbors TV and talking until about midnight, so we turned on the A/C which actually drowned out the noise pretty well. Luckily they sacked out before we were asleep, so it could have been much worse (Bullet #2 dodged). Some advice, try to request a room without neighbors and on the second floor on the back side of the building. Probably a tough accommodation but it would be ideal. Overall not a terrible 'overnighter' hotel. Room was clean and staff was friendly and helpful! The stay itself was fine. The room was comfortable, the pool and jacuzzi clean, the front desk staff polite, the breakfast decent. In fact, I had nothing but positive things to say about this place, until... I realized that I'd left my iPad power cord in the room. I called about it, the cleaning staff found it, and the woman at the front desk, Emily, agreed to mail to me. So far, so good. She asked if I wanted it sent regular, 3-day, or overnight. I said three-day would be good. But before I hung up, I asked how much it would be. "It wouldn't be, like, over $10 or anything, would it?" I asked. "Oh gosh, no," she says. "No more than a few dollars." So my charge shows up on my account today. $33!! I call the motel immediately, and Emily answers. I explain to her the situation. I tell her I'm not happy. I remind her she told me it wouldn't be over $10. "Not even close." She then tells me that she didn't really know what it would cost but that she didn't think it would be more than that. Oops... that would've been nice to know beforehand. She says she'll call the place that sent it then hangs up on me without saying good-bye. She calls back a few minutes later and explains that it cost that much because I'd chosen to have it sent 3-day service. But she was the one who gave me the option in the first place, and told me it wouldn't cost more than a few dollars. Needless to say, Emily said she was sorry but she offered no solution beyond that. So now I'm stuck paying 3 times what the blessed cord cost in the first place. So my view of this place went from A to C- for customer service. A little experience like this makes me never want to stay at this place again. And what a shame, too, because all Emily would've had to do is offer to refund me part of the postage. End of story. Instead, she left me on the hook for a mistake she made. Nice. Our 3 last experiences with Best Western were good, but this one had a lot to be desired. We opted for the suite and when we entered the room, the odor was terrible. We went to the front desk and complained and they gave us a can of air freshener. This kind of masked the smell, but did not completely take care of it. They had not completely restocked the room with basic amenities like paper cups. The location was not great either. We were very disappointed. Walked in the room, smelled like sour cat pee! Took over an hour to get the room cooled down to 78. Road noise was horrendous, couldn't even sleep. Bathtub leaked. This placed should be bull dozed TO THE GROUND!!! Received what they call a mini suite which had a king bed and a sofa sleeper which worked perfectly for our daughter and her friend. Big area to put bags and a nice big mirror with two sinks. Bathroom was very small and the shower had very minimal water pressure. Breakfast had powdered scrambled eggs (bland), sausage links and patties, french toast, biscuits and gravy as well as fruits, cereal and variety of breads and muffins. Overall was a very clean place with a very friendly and professional staff. Very clean, VERY friendly staff, free breakfast, free internet with password (safer than most hotels without password), request a mini fridge and microwave for room, beds are a little lumpy but pillows were SOO puffy and comfortable, tv in room, nice-sized bath/shower. Staff was very helpful and friendly. Room was okay, could use some more pictures or nicer décor. Pillows were uncomfortable for me, too thick and puffy and there was some traffic noise. Otherwise, it was okay. We stay here whenever traveling back and forth to California. It is clean, well cared for, and has a very friendly and helpful staff. It also has a very comfy bed, good Wi Fi, and a hot breakfast. There are several restaurants nearby to walk to so one does not have to get back in the car after a long day of traveling. I stay here every year in May. As always, courteous and efficient staff. This was the first time I stayed in the handicap room. It was clean and well laid out. Best ADA bathroom I've found in Oregon. A full Breakfast buffet is offered every morning, complete with sausage and eggs! Close to major transportation roads, excellent staff, clean rooms and near (very short walking distance) of three major restaurants. Great value for the money. For an "under $100" night, you got the basics in a clean package. No refrigerator in rooms, small but clean. Although near I-5, motel was quiet with no "road noise". Safe parking. "Needs new beds, soundproofing, and blackout curtains"
Nice staff but given the things I mentioned in the title, I can't recommend it. The bed was particularly uncomfortable. I could hear neighbors above and beside me. Curtains would not block out all the light. Location was pretty industrial strip mall. I think there is better value elsewhere until these problems are fixed. Traveling through this beautiful area, this was a convenient, overnight stay. 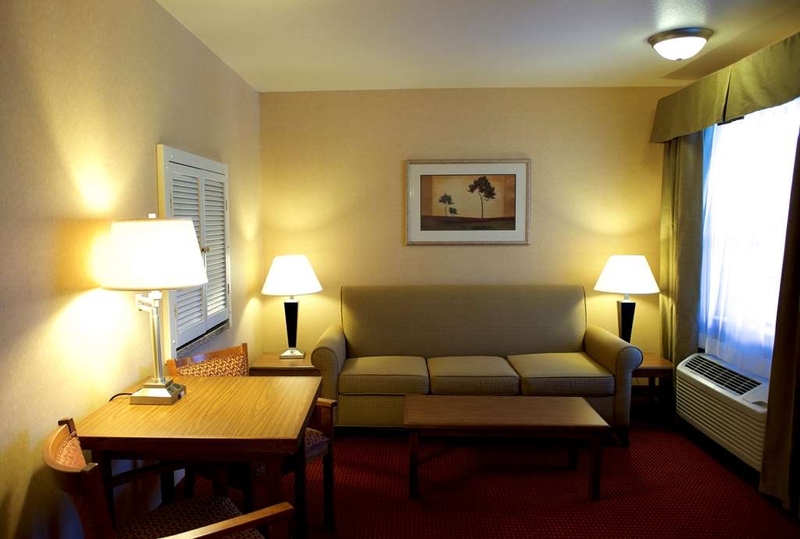 Room was clean and comfortable, the staff friendly and helpful. Needs updating but the price was right! Also, we were given a discount coupon to nearby Elmers Restaurant, for dinner and breakfasts. The staff is great. Right off highway. We stayed one night on our way to California. Hot tub and pool were nice. Breakfast was fine. Room was a bit smelly. Pet odor. A pair of ducks make this hotel their home. For the price that they charge this hotel should be a plus hotel. After our first day we did not get any shampoo, conditioner and lotion. Had to go to office to request lotion. Room was not really clean. "Decent room, bad customer service"
We had left our home for vacation later than we wanted, but we were on our way. We called to let them know about our later arrival which would be about 2am. After gas fillups, feedings, and diaper changes, we would be arriving closer to 4am. I called to let them know we would be getting there at 4am, just enough for a quick shut eye to continue our vacation. They girl responded on the phone "You do know that check out is at 11?" I said yes and that we were getting there as soon as we could. I found the girl's response to be rude and disrespectful. I really wanted to be there around midnight, but life happens. Ive always assumed that hotels were a place for comfort and rest for travelers. I guess not. Besides that, the room was just what we needed for a family of 5 (3 boys ages 4, 2, and 6 mo). Nothing fancy or luxurious, just a place to rest our weary heads. Hotel was expensive for the condition it is in need of a remodel. Rug in the room was stained and furniture was old. Was required to pay a pet fee even though the room was beyond any damage he might have done. Breakfast area is very small but items were acceptable. One off the best hotels we've stayed in, very clean, great location right off the freeway, clean fresh rooms, quiet. 10% Discount at two of the restaurants close by. Check in was quick, friendly. We didn't use the pool or hottub as we were too tired from our long drive, but it sure looked inviting. Breakfast was very good, lots of variety which is nice for us healthly eaters, my only recommendation, I'd like to see recycle for those breakfast dishes. Great stay, see you again. "Good but inferior to BW at Medford"
Having stayed at the Best Western in Medford, we were a little disappointed in this motel. It seemed a little aged. Lacked wall plugs. Wall plug at desk was covered by a mirror. Nice large king bed. WiFi had bad spells and was not as good as I normally experience at motels when traveling. Room was right over the office with a fair amount of noise from the street outside amplified by it being on a steep road. Pleasant staff. Clean, comfortable, good breakfast. A bit dated and not as nice as most Best Western's I've stayed at but still lives up to my Best Western expectations and satisfaction. Maybe a bit pricier than I would like to pay for the quality of stay, it was a Saturday night so I guess that explains it. Would stay again. Good bed, clean and decent value. The hot tub was nice after a 10 hour drive. The hot breakfast was also good. I would stay there again. 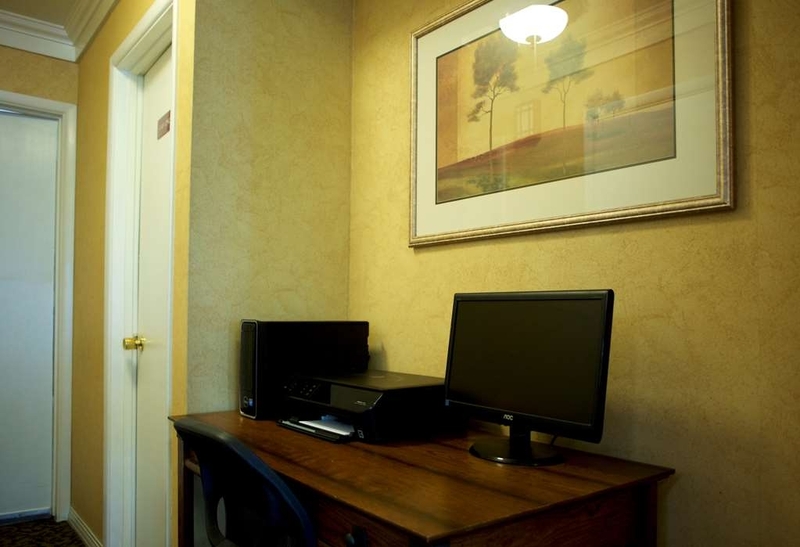 The room was very clean and it was a location close to restaurants and grocery stores. "Easy to find, hot breakfast." Room was good enough, sadly they could not get the outdoor warm enough to soak. Very convenient location, friendly staff. We paid extra for the larger spa tub in bathroom, so I got a nice hot soak after all. The room was clean and the king sized bed was very comfortable, but the walls were very thin. Noise from other guests was enough of an issue that I slept with earplugs in the whole night. The room had very dated decor, and was a bit small, but was fine for a one night stay. The breakfast was disappointing - not many healthy options, no gluten free options, and all of the dishes were plastic/throw away items. Our stay was great except for a little mold in the shower area. We were asked to move our truck and trailer away from our room to accommodate another customer. We needed the extra spaces but the parking lot was not very accommodating. They allowed us to have our pet in the room which was wonderful. We have family in town so we stayed a few days. We were very impressed. Employees were very friendly. Definitely our home when we are in town next time!! I would recommend this hotel to anyone traveling through the Grants Pass Oregon area. I have never experienced a friendlier staff or comfortable beds. After 12 days in a hotel you learn the ins and outs of the staff. Again, I can not overstate how wonderful the staff was and how lovely the rooms were. Just a great hotel everything was so nice. Rooms are very clean with a great breakfast . Went in the pool area very clean we would stay there anytime .Stop by there stay you will be very happy with the hotel and host's. "Charming BW with close freeway access." This charming, updated BW has everything you need for a comfortable stay. While it is an "old school" style motel with 2 floors and open, covered hallways, the rooms have been updated with comfortable beds and modern designs, and the exterior is well kept. (The stairs were not covered so in the rain be cautious when walking down the stairs, especially if carrying luggage.) The motel is located within walking distance of two family style restaurants, and easy drive to many others, plus shopping centers too. Our room was on the side facing Hwy 199 and there was some road noise early in the evening but it quieted down by the time we went to bed, so it was no problem. The room did not have a frig or microwave like some BW, if it matters, but we didn't miss them at all. The breakfast was help yourself and even had hot food choices; scrambled eggs, 2 types of sausage, biscuits and gravy, French toast, plus the usual cereals, breads and muffins, yogurt, fruit, coffee and juice. We enjoyed all our selections. We would definitely stay here again if in the area. Location to Hwy 5 is very convenient, unless you prefer to be in a quieter, less busy area. very easy on and off I5. Many restaurants and shopping close by. Nice room at a good value, very helpful staff. I would stay there again. Very clean, very little to upgrade to a mini suite, Nice pool and hot tub, that was steaming even in the 40 degree weather. We were in town for a high school sporting event and chose to stay at the Best Western as they had a good rate and God reviews on Trip Advisor. The rooms were clean and comfortable and the service was great. The breakfast was better than most free breakfast at other chains. Would definitely recommend and return to this hotel. We have stayed here before because it is near some shopping, restaurants and the freeway, so it is a convenient place to stay for one night. The receptionists are friendly. The breakfast is ok, the usual things like cold cereal, instant oatmeal, sausage, scrambled eggs are served. There was no fridge or microwave in the room, but there was coffee. Nearby restaurants are Applebee's, Elmer's, Shari's. This stay I found the bed uncomfortable for me, but my husband did not. The room was clean and tidy. This hotel stay was very enjoyable overall. The room was clean and the beds comfortable. The service was excellent, and the breakfast delicious. The only complaint, and I am sure most people will consider it a tiny one, was that the TV remote had NO mute button! How odd was that? But overall, we were very pleased, and plan on staying there on our next visit to the Grants Pass area! 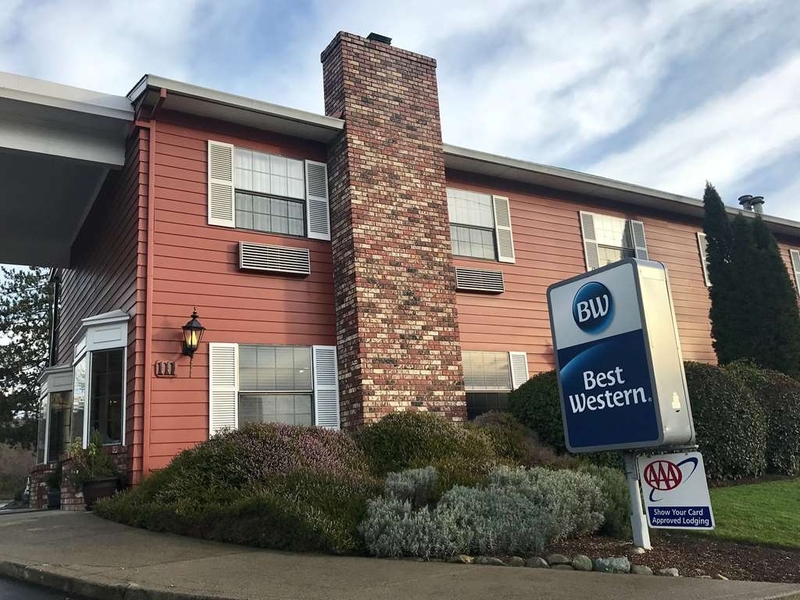 good Best Western- room had been updated, staff friendly and efficient- close to the Interstate and surrounded by a variety of food options, although the best are in downtown Grants Pass about 5 minutes away. "Pet area is small and full of staff smoking on break"
There is a lot of road noise, so bring your ear plugs. The pet area is small and often occupied by staff smoking on their break. I expected an in room fridge, because other Best Westerns that I have stayed at had fridges. The website does not mention a fridge, so my mistake. We made reservation for a king bed and they give us whatever they have left. This is not the first time they did this. They didn't care when I called and asked about getting 2 queen beds. Isn't that why you make reservations. Then we still paid for a king bed. I stay here often and it's always the same good quality. I know what to expect and have never been let down. I recommend this hotel when traveling through or as a destination. Nice pool, BBQ area and great free breakfast. This hotel will not book rooms to locals. A friend of mine that lives two towns away wanted to book a room for his wife and himself as weekend getaway without the kiddos. He booked the room online and they called him back to tell him that he was not welcome there. Bad business practice. I would not recommend this place, there are actually plenty of other options in the area that don't discriminate. This is a great place to stay and see the area of Southern Oregon. Grants Pass is a growing City and a lot of sites to see around to area. The small areas around there are great (Cave Junction) and not far to held back to town with everything a big city has but not the traffic. I have been to area before and stayed at different hotels but seem to like BW the best. I will be looking forward to going back to area soon. Tried to cancel the morning of but was informed to a new policy requiring 24 hours notice. Small problem at check in. Motel was clean. Room was ok nothing special. No microwave or refrigerator in room and none available. Room on the street side was very noisy with traffic and restaurant traffic. I travel for work and stay in hotels quite often I will not be staying here at this Best Western again. 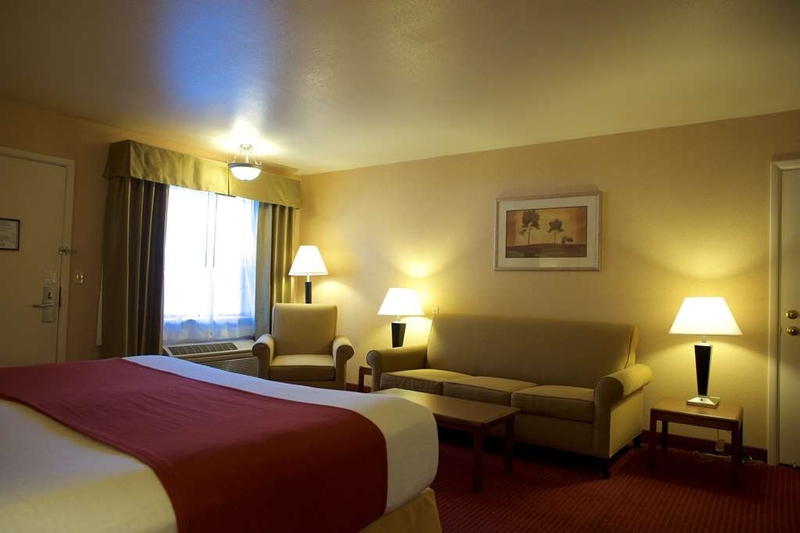 "Best Western Grants Pass Inn"
When traveling to Grants Pass the place to stay is Best Western Grants Pass Inn. The staff is great every time I go there. Also, this Best Western is close to restraunts, stores, etc. There is always someone in the front office if you should need anything. The room had everything we needed. I would highly recommend anyone traveling to Grants Pass to stay here. I do every time I go. One side of the hotel faces a street and you can hear it all. Maybe other side might be better. Room was clean, but nothing great as well. Bathroom did smell like smoke all throughout the stay. Breakfast was typical and setup like most hotel mini buffets. Will stay at the shilo next time. "Great suite for a great price!" We rented a two room suite with a king bed and jacuzzi for two. There was ample parking and the vending machines were easy to find. The room was very clean and well stocked. The breakfast was really good for a Continental and they had gluten free toast! We would definently stay here again! This was our second stay at this BW. 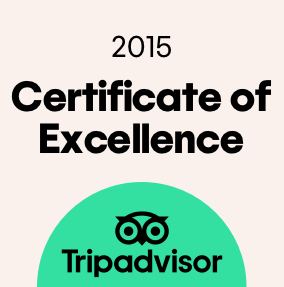 We had excellent experience just as our first stay. The front desk staff was very friendly, the room was clean, the breakfast was hot and well prepared, the rate was reasonable. Our room was facing Holiday Inn, it was quiet at night. Our room was clean and comfortable but VERY NOISY. If you are on the "uphill" side facing Holiday Inn it is OK. The "downhill" side, facing Elmer's Pancake House, gets noise from a very busy street. Racing engines, loud car radios, screeching tires are not conducive to restful sleep. Staff were polite and friendly. Breakfast was pretty good. Noise was only negative, but a big one. Our room was very spacious, The bedroom was attractive and very comfortable. All the staff were prompt to see if there was anything my wife and I needed. They were most kind when we asked for ideas for going out for dinner. Just a very kind staff and easy on and off of I/5 both north and south bound. Staff is very nice. I was greeted with a good morning every time I was at the front desk. The rooms are modern with a very comfortable bed and soft linen. My room had a flat screen t.v. even though the pictures showed old tube type t.v. The breakfast was scrambled eggs, patty or link sausage, biscuits and gravy, toast, muffins, a full assortment of breads, and fresh fruit. I was in room 143, facing Interstate 5; the car noise was not bad but next time, I would ask for a southside room. I would also ask for an upstairs room as I could hear the people upstairs walking. The Best Western is conveniently next to the freeway and Elmers is a nice family restaurant that is about 100 feet away. From extremely professional and helpful office personnel, to strong WiFi, to the quiet, clean, and nice sized room, this was an excellent motel for my purposes. The breakfast quality and type of options was very good. Great access from the freeway, and many nearby restaurants and stores. Easy to find, and in every way, a good value for my money. 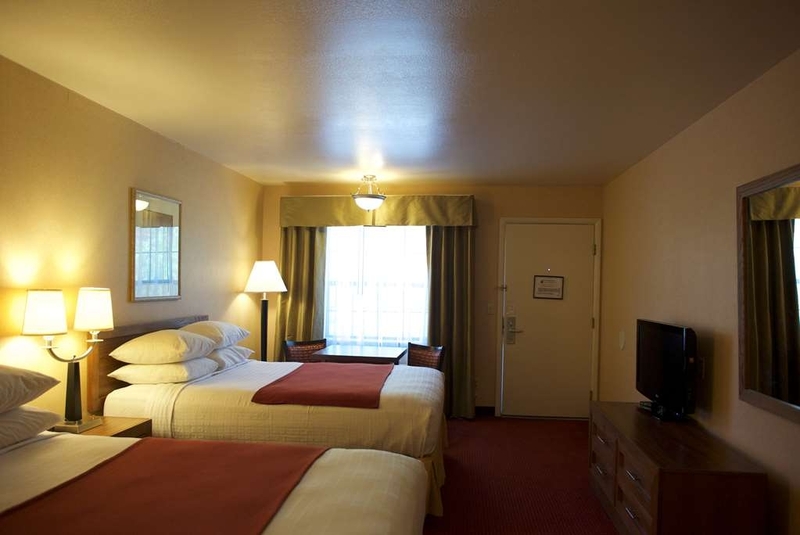 "Our go-to motel in Grant's Pass OR"
Comfortable room, accepts Triple-A. Have stayed here before and the staff is very nice every time. Only complaint is that the room was directly over the entry to the lobby, and cars would idle there to check in. I called twice to the lobby to please ask them to kill the engine or move the car; the fumes were being sucked into the HVac unit. Breakfast was included, a nice touch. Noticed that the pool was open, but November in Oregon? No thanks, didn't try! 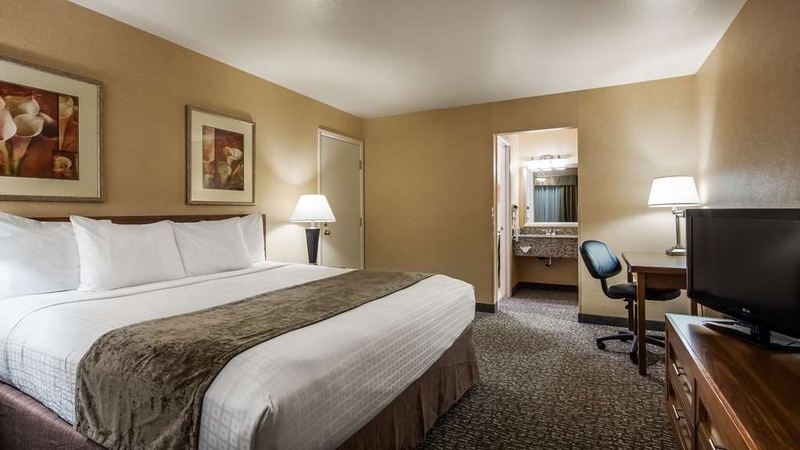 "Best place to stay in Grants Pass Oregon"
Best Western in Grants Pass is the only hotel we stay at because of the great service and the rooms are very nice. We come up to Oregon a lot and always stay at this hotel for the Excellent service. Only thing I do not like about this Hotel is it sits real close to Interstate 5 and the trucks coming down the hill are always on the Jake brakes, can be bad if you're on the South/West end of the Hotel. I try not to get a room there. The rooms need to have a refrigerator when they are refurbished. The beds were old and worn out. Otherwise they hotel provided us with a decent place to stay. I would certainly put the hot tub and pool inside where all the guests can use they instead of being outside. On this trip we have had good luck with Best Westerns, but this particular location left a bit to be desired. When we called to ask about - smoking, pets, availability...we were told the beds were comfortable. Upon entering the room - it was clean , did not smell- as some Yelp reviews had said..... But I knew when I looked at the beds, They probably were Not very comfortable. Laid down around 1:00am , and was in terrible pain by 5:00am ! Our room was 109 - double queen smoking- pet friendly room . Very uncomfortable!!! If you have a bad back this is Not the room for you ! If you have a good back , chances are it won't be feeling good when you leave! We would not recommend staying here , without checking the beds out before you commit to staying . I will throw a positive out here- the shower was nice - plenty of room ( height wise ) as the last place we stayed the shower head was too short for me , and I'm only 5'2 . We had a single queen room. It was about what you would expect. It was clean and comfortable. The "view" was of a commercial area so no points on that. But it was just for one night on our way to California. When we checked in it was pretty late at night, so all we wanted was a quick check in process. The staff did that! Quick and easy! I would recommend this hotel to my friends and family. We did not have any problems during our stay. The breakfast could have been a little better but it was still good. The staff was helpful during and after check out. Nice and clean, we realize we like the hotels more than the motels. Loud outside with window and door right to the parking lot. Otherwise it was a nice stay. Breakfast was missing the waffle machine! Some of the food items did not stay stocked during breakfast. Spent one night there, Room had an overpowering air freshener smell. About 10 PM when the air freshener wore off the room had an overwhelming smell of either stale cigarettes or wet dog. Had foot traffic back and forth all night banging into the door and other doors. It was quite easy to listen in to the adjoining room's conversations. I almost could have participated in the same. It was a good thing my wife was not with me; we would have been changing hotels in the middle of the night. The capper though, I was there with a party which had rented several rooms. At least two of the rooms ended up with bedbugs. One wife had to go to her doctor to remedy the situation. So when I got home and had already unpacked and put things away, my wife and I had to run all our clothes through the dryer to kill remaining bugs. Never ever will stay there again, I do not want to even get near their parking lot. Clean, friendly staff. Old property. Some updates needed. Although easy access from freeway the exit road was super noisy. Loved the 10% off at nearby food venues. Would like to see some updates done to the rooms. Old, and in need of some repairs. Disclaimer: I stayed in handicap room I have been on vacation for the past 2 weeks staying in Best Westerns throughout Oregon and this is the WORST bed and room of my trip. Other patrons at breakfast stated their rooms were comfortable so it could have just been the handicap room although hotel staff stated ALL the beds were replaced recently. Hotel Staff, pool, and hot tub were great. Room was clean but felt extremely cheap and not to Best Western Quality. Best Westerns are normally my first choice for hotels while traveling for quality and safety and this room was below the Best Western standard. Great customer service and good beds. Nice clean rooms and hotel. Traveling with 2 young kids and spouse. Quiet rooms to sleep in. Breakfast had a nice variety. Loved the location. Easy to get it and find. Outside was clean. Cars felt safe to leave in the parking lot. The kids loved staying here and slept like babies. The beds are comfy. This hotel staff were all enthusiastic and responsive to our every need. Everything was very clean and comfortable. It is very convenient to many stores and restaurants. They even had a discount arrangement with two nearby restaurants. Tip: ask for a room away from the highway intersection. Consider a seocn floor room and carrying your luggage up the stairs to avoid noise from anyone above you. Rooms have outside entries. Great for anyone motorcycle traveling. "Excellent place to stay in Grants Pass"
we will be back. Close to shopping. Close to sight seeing. There were coffee shopps near by. A good choice of quality resaurants near by. We will deffinatly be back here. The staff was so very friendly. The pool and all area beautifly landscaped. 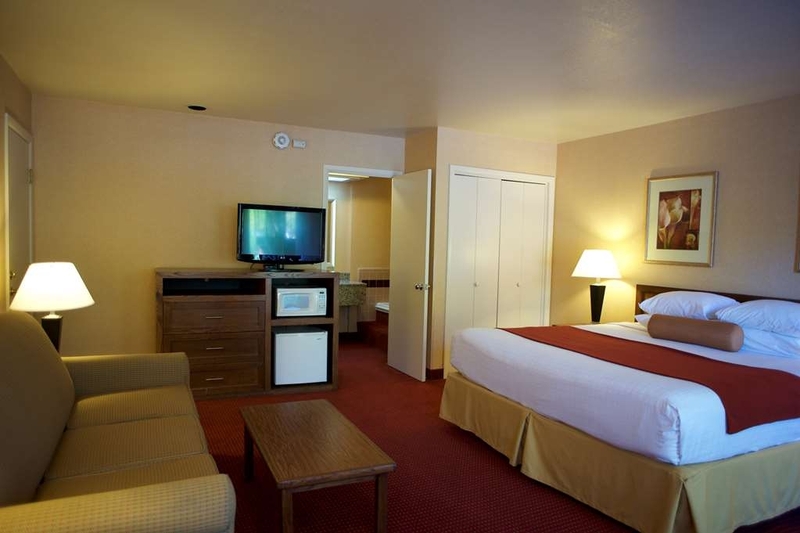 "Great stay at Best Western in Grants Pass Or." "Great Mattress and low price were the best features"
Honestly loved the mattress and bed. The room was a good value for the low-low price. The breakfast was below average for a Best Western. Some noise from trucks grinding gears in the morning but not too bad. I would not stay at any other place, Thank you B.W Inn,!! You are the Best! The entire staff is A+ with their Customer Service skills matching or beating those of a 500.00 dollar a day Hotel. I would gladly recommend the Best Western Inn, in Grants Pass,Oregon, to any and all, and they are kid friendly,pet friendly, people friendly!! Heck, they got all of the bases covered! I'm very impressed! And continue to be, with each and every stay! "Not a Bad Place, Just a Bit Noisy"
I could stop at the title, but that would short-change the rest of the hotel and its good points (not to mention the 200 character minimum for reviews!). So let's get that out of the way up front...This hotel is a little older (but well-maintained) and has outdoor room entry, which means those rooms facing the highway have little in the way of noise dampening. The walls were a bit "thin", as well - I could hear conversations in the next rooms (not what they were saying - that was muffled) at a noise level that was a bit uncomfortable. I noted this to the front desk as we checked out - not that they could do anything about it - but to note that our stay was not quite perfect. OK, now for the better stuff - The room was clean and comfortable, the staff was friendly, and the breakfast was better than average - waffle, sausage, scrambled eggs, biscuits & gravy, French toast. 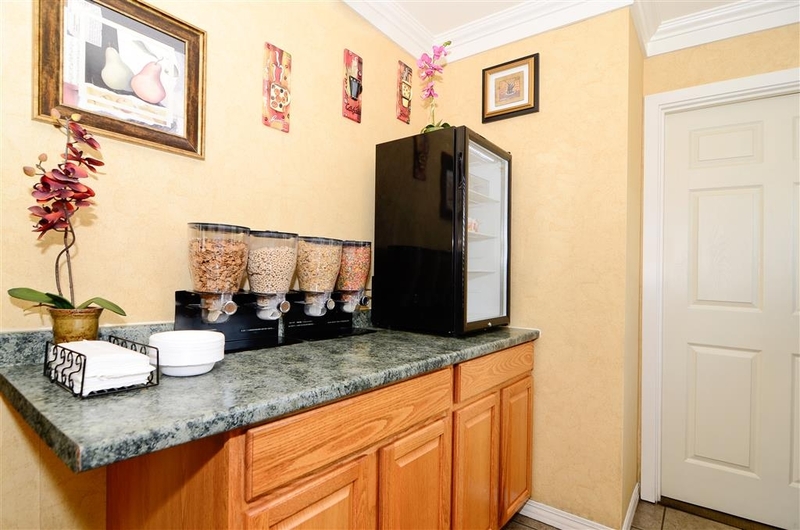 Refrigerator and microwave are NOT a standard amenity, although it appears they are available upon request (there is an empty spot in the room for them), perhaps for a fee. The wi-fi worked great, everything was in good, working order. 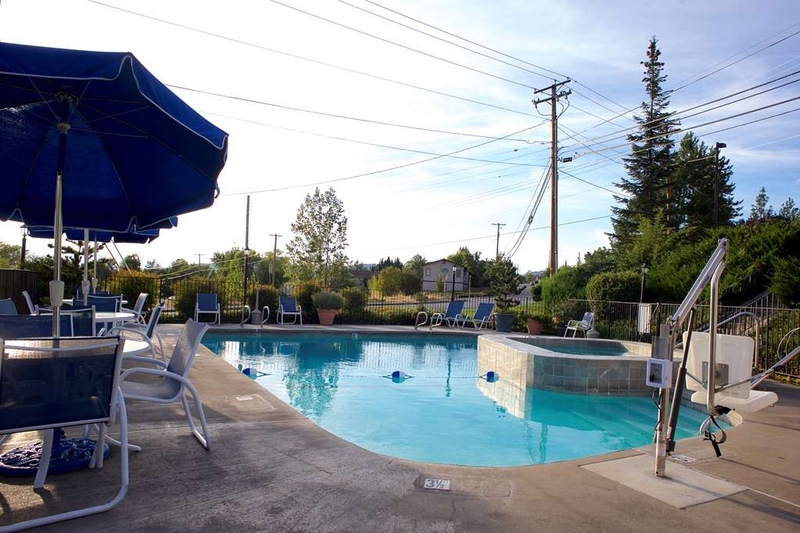 There is an outdoor heated pool, which looks inviting on a hot summer day. Elmer's restaurant is in the parking lot. It's good, not great, but we got a discount by showing our room key. Also a Shari's restaurant across the street. Lots of shopping nearby, but recommend driving there. US 199 is high-volume and not real pedestrian-friendly. Downtown Grants Pass is worth the time to explore, especially on Saturdays when the Growers Market is in place. There is good value here, and is at least worth your consideration. We decided at the last minute that we were too tired to continue for the rest of our trip. We wanted a place for ourselves and our dog that would be clean and convenient. We called while a few minutes away and asked for a room to accommodate us and our dog. We got the front desk of the hotel (not a reservation service). The lady who answered assured us that they had a "pet-friendly" room and agreed to hold it for us. The room was ready when we arrived - clean, and pleasant (not smelly). We were told that the Elmer's restaurant next door offered a discount to Best Western guests, but we chose to eat the free hotel breakfast instead. Scrambled eggs, sausage, biscuits and gravy, french toast, fresh coffee, juice cold cereals and fresh fruit. Pleasant dining area in the hotel's lobby. Friendly staff - attentive but unobtrusive. Consistent with the Best Western quality.